Banner Uniform sells these vests to us for just above wholesale, to help us put your hard-earned donations to provide the best quality at the best price. We pay $1400 plus delivery. $1400 total buys a bulletproof vest worth $1750 plus tax and shipping retail. 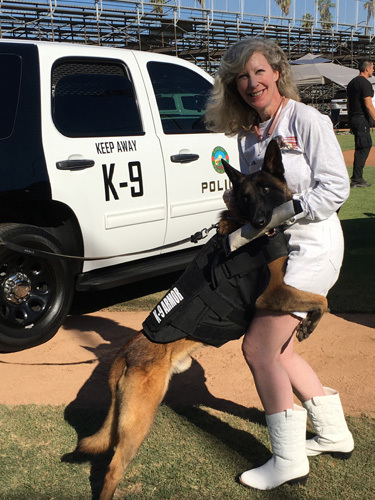 Suzanne Saunders, K-9 Armor Co-Founder, Treasurer and Webdiva thanks Jason Worth, former President of Banner Uniform for these K-9 Armor bulletproof vests. Made from the same Kevlar® bulletproof cloth as their human partners, covering all the vital organs. 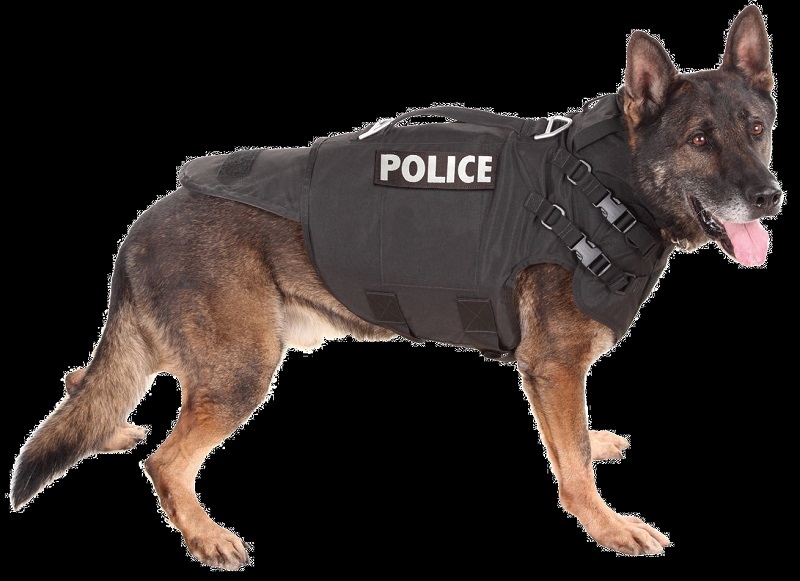 All K9 Handlers wear NIJ 0101.06 Type III-A and their vest covers all the vital organs. If their K9 is wearing K-9 Armor, they wear the same level of protection. 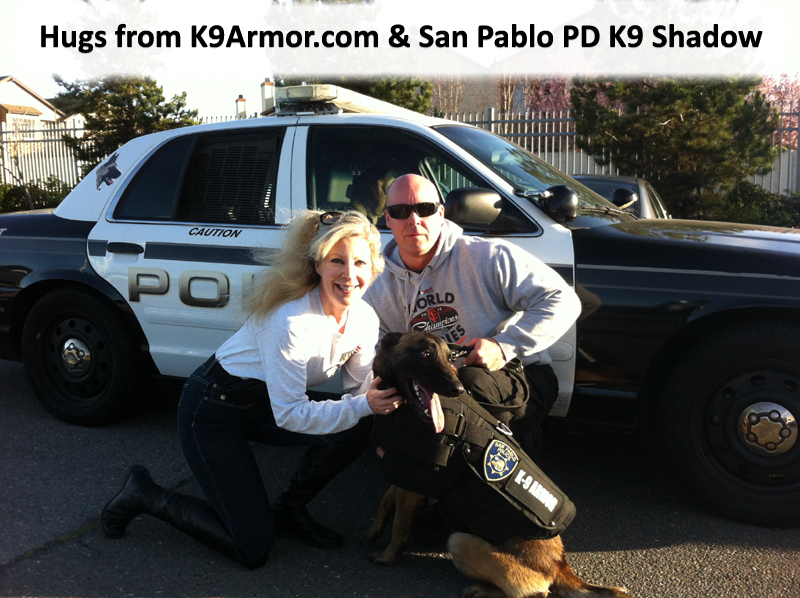 Over 100 K9 Heroes protected with K-9 Armor bulletproof K9 vests! 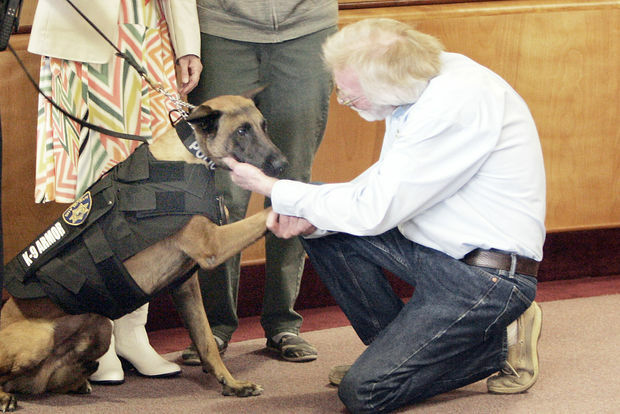 K-9 Armor promises 100 percent of your donations go only to bulletproof vests for police dogs, no other purpose. When you donate for a vest, you choose which K9 Hero to protect. See below for a list of generous sponsors who helped protect our K9 Heroes and the K9 Associations who bestow the honor of protecting the police dogs who lay down their lives to protect us. Thanks to Frank Skubal, President of Banner Uniform, who purchased Banner Uniform from Jason Worth, and honored our agreement to purchase the KEVLAR® vests NIJ (National Institute of Justice) standard for police officers, Level IIIA, fitted to each dog including patches for their department. The vital organs are all protected by three bulletproof panels. 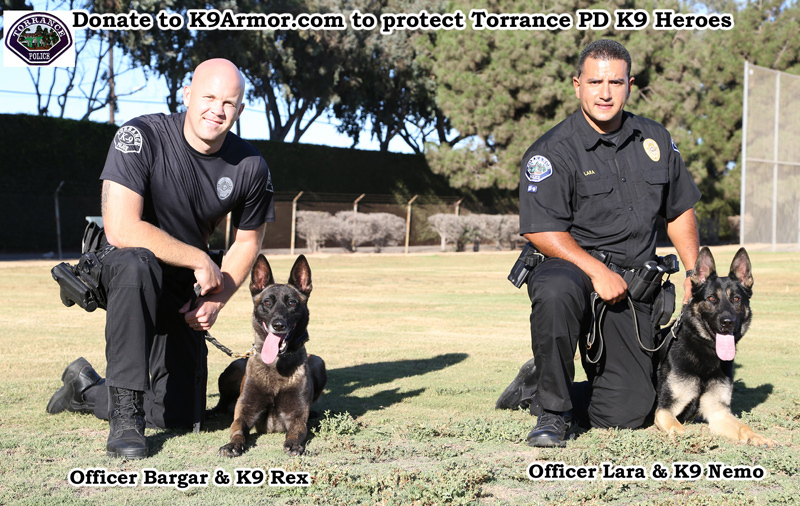 Thank you Banner Uniform and Point Blank Body Armor for helping us protect all the police dogs of California. K-9 Armor promises all our vests are the same standard as their human partners and always have been, set by National Institute of Justice (NIJ) currently level IIIA. This level three stops a .44 slug, 7 times bigger bullet than older type II. All Handlers are wearing minimum type IIIA (three A) and we believe the police dogs deserve the same quality and protection, our vests also cover all the vital organs, with arm holes for four legs instead of two. K-9 Armor receives this incredible price less than the $1750 retail. Thank you all the staff at Banner Uniform and Claudette at Point Blank Body Armor, the manufacturer of the underbelly Type IIIA for dogs, for granting us the best price to protect all the dogs with the best in body armor. Richmond PD K9 Sabre was K9 Armor Success #20. 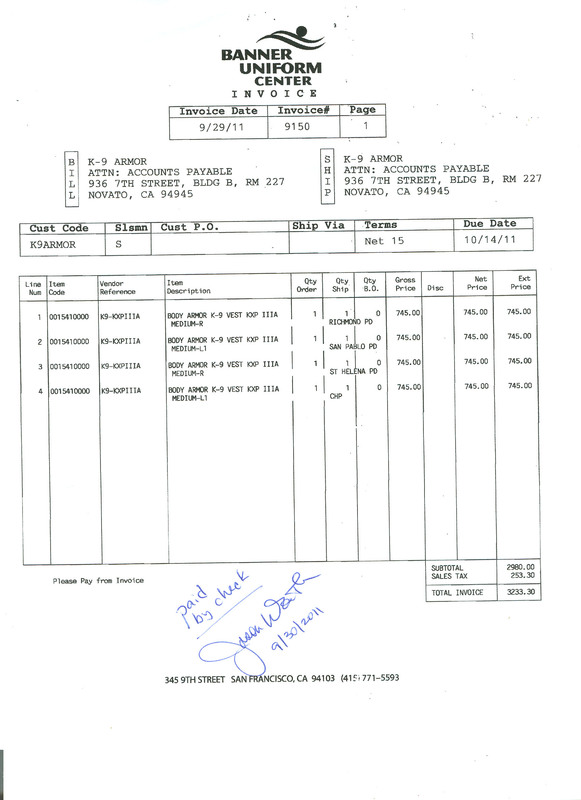 In 2011 we began posting receipts to keep track of how many K9 Heroes we protected and show Sponsors proof your donations protected the K9 Heroes we love. Click the links below to see actual amount on invoice paid for each vest. 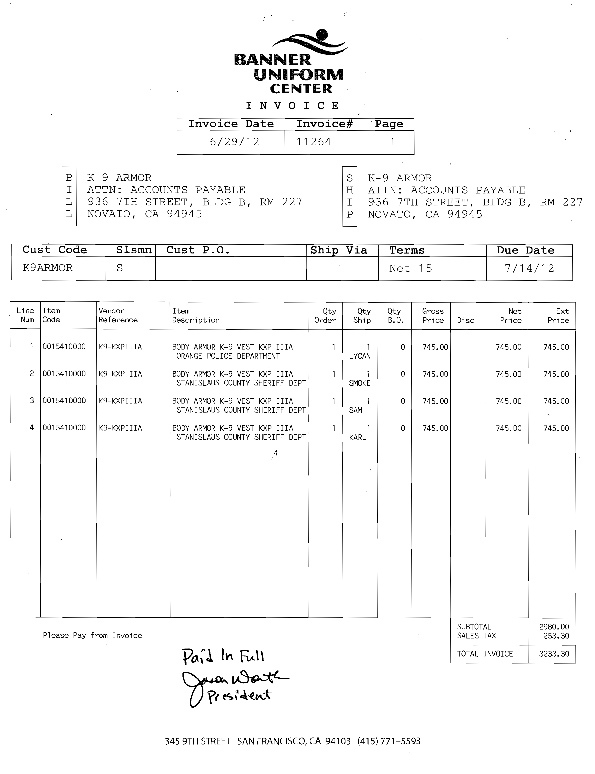 K9 Armor vest receipts. Click each link below to view pdf. Total: 120 K9 Heroes protected thanks to your generous donations! Thank you Samantha Constable of Santa Clara for a donation of $2000! for St Helena PD K9 Barrett. Thank you Dr. Gold & Nadya Simon, Veterinary Assistant at St Helena Veterinary Hospital for treating our K9 Heroes and donating for St. Helena PD K9 Djino and Napa County Sheriff K9 Nash. Smiles from St Helena PD K9 Barrett for his K-9 Armor vest paid for by Dr. Gold of St Helena Veterinary Clinic and Samantha Constable of Santa Clara. Smiles from Claremont PD K9 Luther for his K-9 Armor vest paid for by Rhonda and Rick Speiers of Claremont. Hugs to Mr. Nick Deffterious for a generous donation to protect Sheriff Mike Poindexter's partner K9 Aggie. Thank you so much for helping keep our beautiful Aggie protected with the K9 Armor. 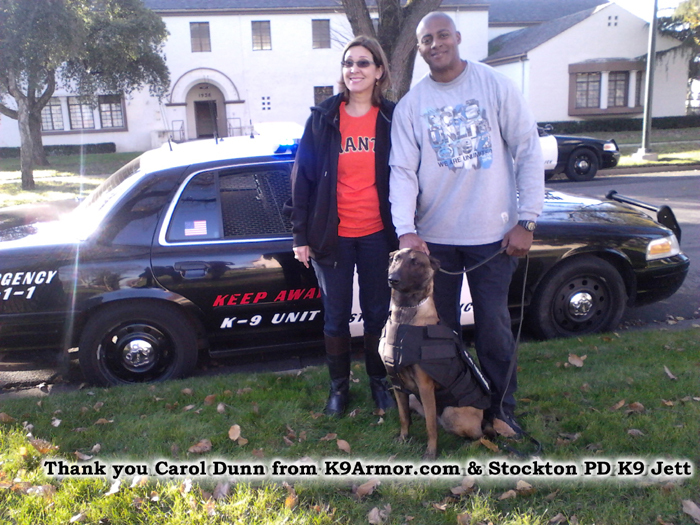 Many thanks to Diana Chang and family for donating a K9 Armor vest to protect Gardena PD K9 Reno. Big thank you to our most faithful sponsors Mike and Krista Pennington who donated for us to appear in the Orange County Police Canine Benefit Show in Anaheim every October. 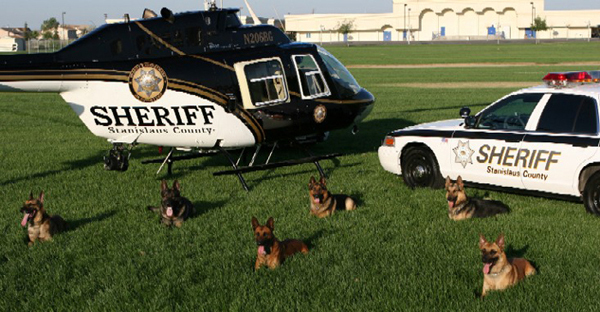 They donated over 15 vests since 2011 to protect their K9 Hometown Heroes of Orange County. Join us for the Orange County Police Canine Assoc. K9 Benefit Show every year. Thank you OCPCA President, Anaheim PD Officer Brett Klevos and former President Placentia PD Officer Chris Anderson and former President Irvine PD Officer Bob Smith and Event Director Vince Palazzolo, for granting us the honor to protect your beautiful police dogs and for inviting us to your awesome show! And join us for the Riverside Sheriff K9 Trials, Norco, CA. 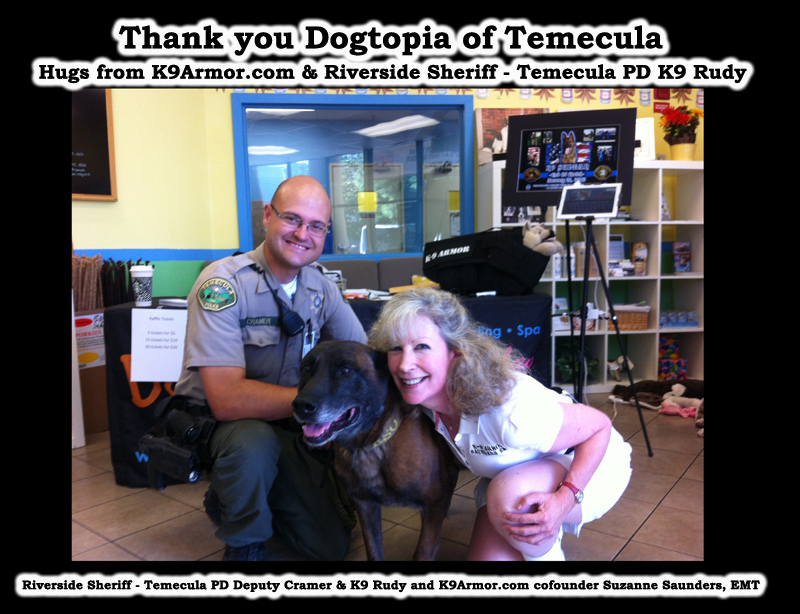 Thank you Riverside Sheriff K9 Association we are honored to protect your K9 Heroes. Click the link to open pictures and details on their web site. Thanks to the Devlin Realty company who offered us a table to share at the K9 Trials. If you ask them to donate to K9 Armor, they will use the closing costs to donate a vest. Nathan Devlin is not only a generous realtor but an active Corona Police Officer. Thanks April and Nathan Devlin for sharing your space to deliver these life-saving vests to OCPCA and Riverside K9 Heroes! 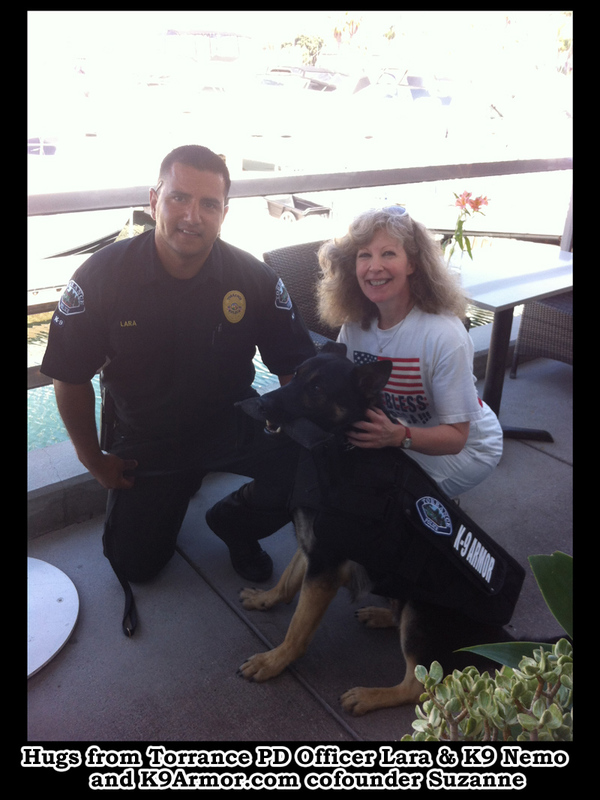 A special thank you to Maria Malter of Palm Desert for donating a K9 Armor vest to Palm Desert Police K9 Rio. 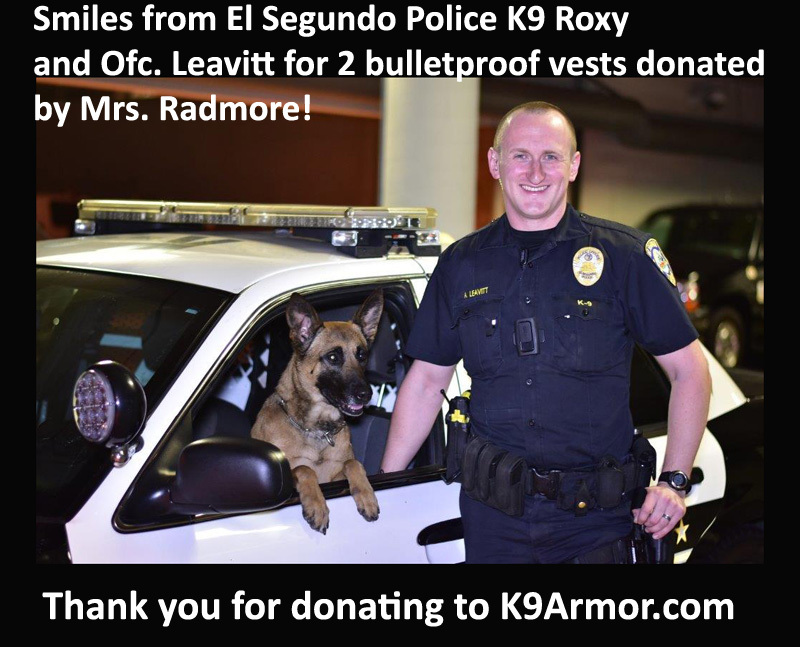 Hugs of thanks and appreciation to Mrs. Radmore, aka Aunt Audrey, who donated for two vests to protect El Segundo Police K9 Leo and Roxy. Thank you El Segundo Police K9 Sergeant Turnbull, and his Aunt for her generous donation. 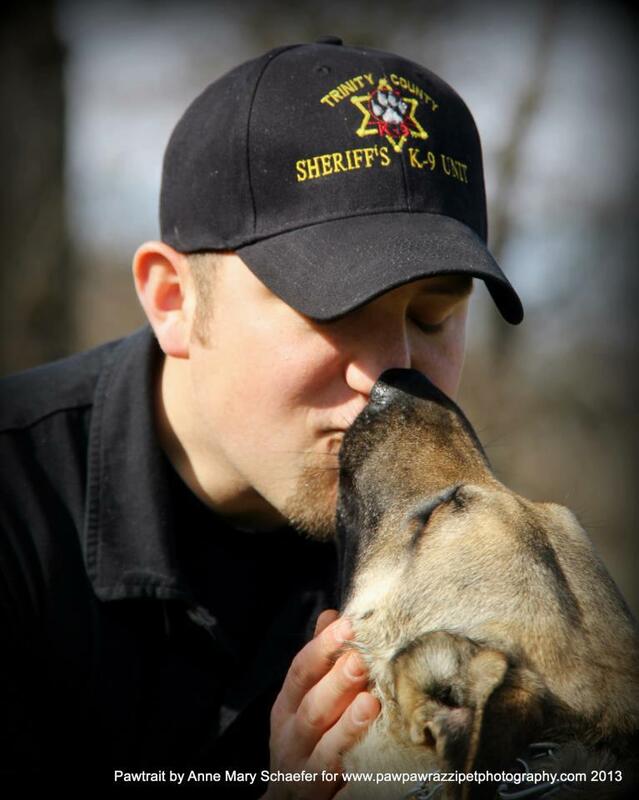 Many family members donate to protect the K9 Partners who protect the people they love. We are honored by El Segundo Police and all the departments who refer family to us to protect the police dogs who lay down their lives to protect us. El Segundo Police K9 Roxy and Leo! 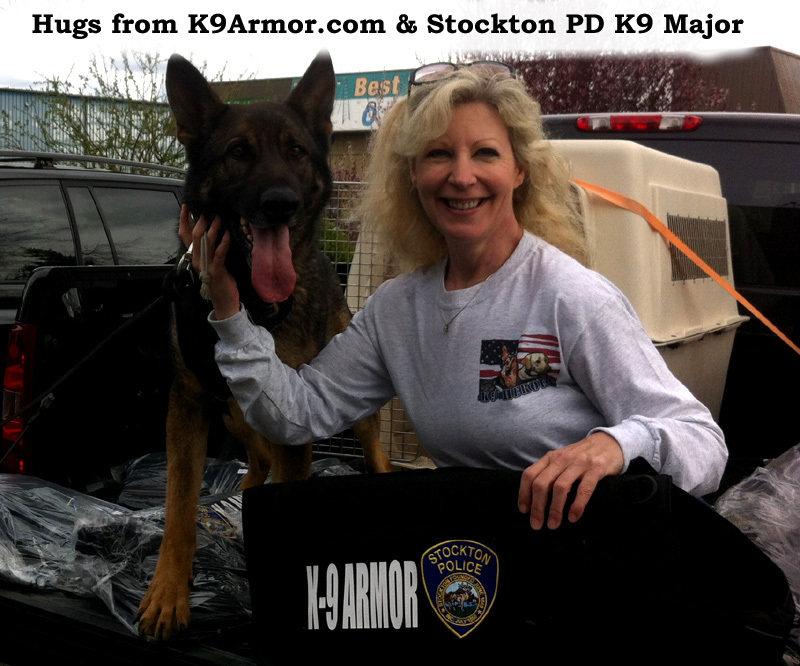 Thank you Mike and Linda Hirabayashi and Tucker, for your fifth generous donation of a K9 Armor vest for Stanislaus Sheriff K9 Dexto. Added to previous donations in 2011, 2012, 2013, 2015 and 2016 to protect the police dogs who lay down their lives to protect us, with a special love of Malinois! 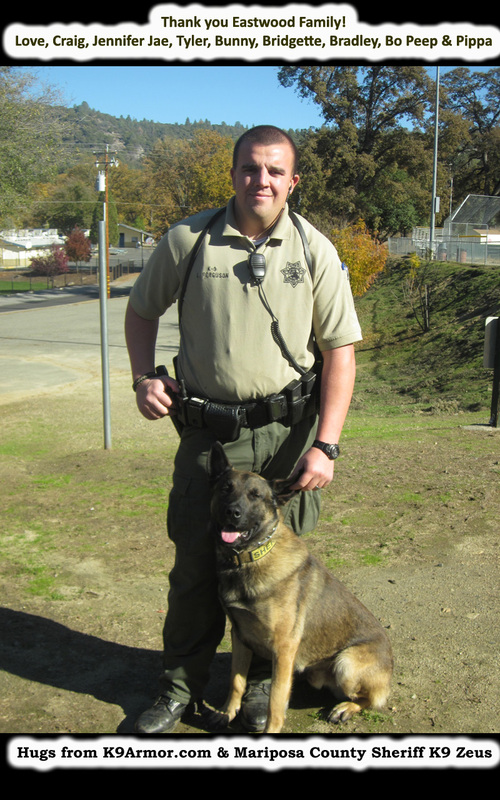 The Malinois police dog we covered in 2012 was K9 Smoke for Stanislaus County Sheriff. He needed a little makeup money for the Wish on Facebook that raised enough for almost 2 vests. Thanks to Mike & Linda & Tucker, we were able to make up the difference so all of their beautiful dogs can wear a vest and Smoke is a Malinois K9 Hero! 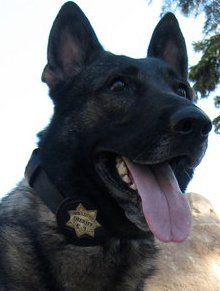 In 2013 the Malinois was Mariposa Sheriff K9 Zeus who waited a year in need of a bulletproof vest, thanks to Mike & Linda by January 2014 we could protect Zeus! 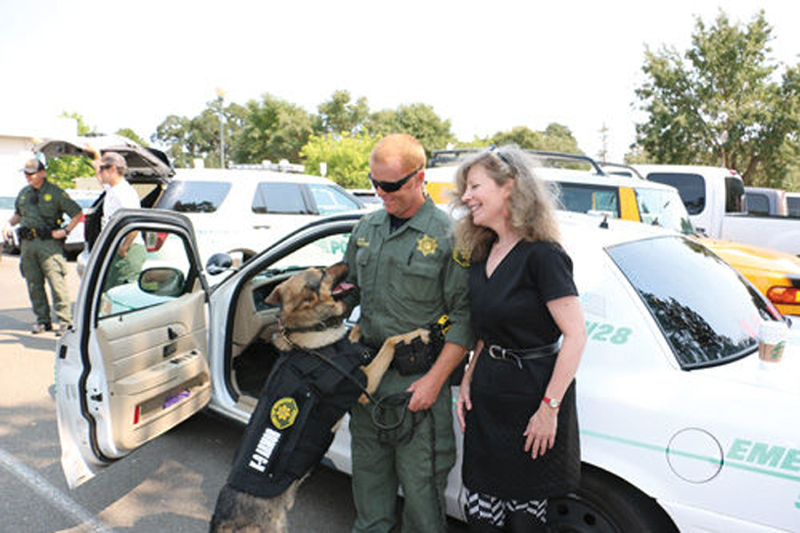 K9 Armor Cofounder Suzanne Saunders measures Stanislaus County Sheriff K9 Smoke while Deputy Thompson gives approval and smiles. 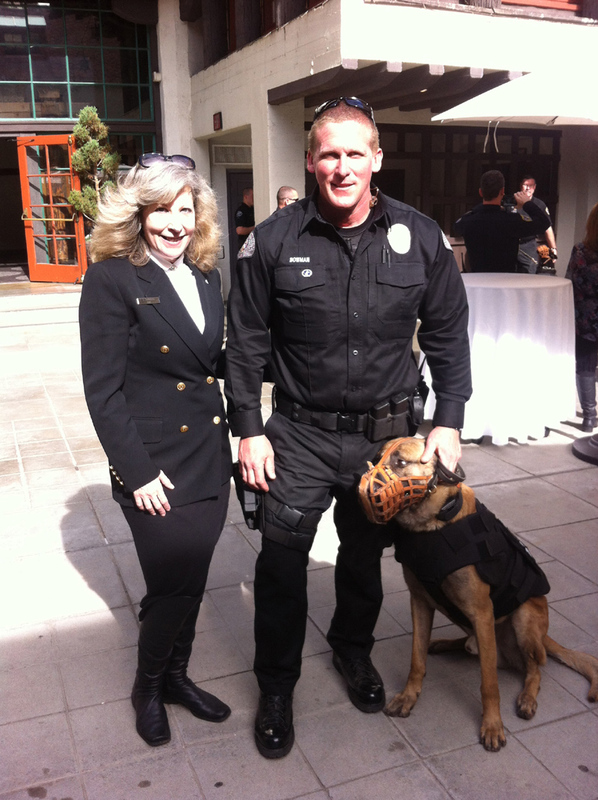 Thank you Mike & Linda for protecting so many K9 Heroes with K9 Armor. Thank you Friends of WCPD K9s for the honor of protecting all your West Covina P.D. 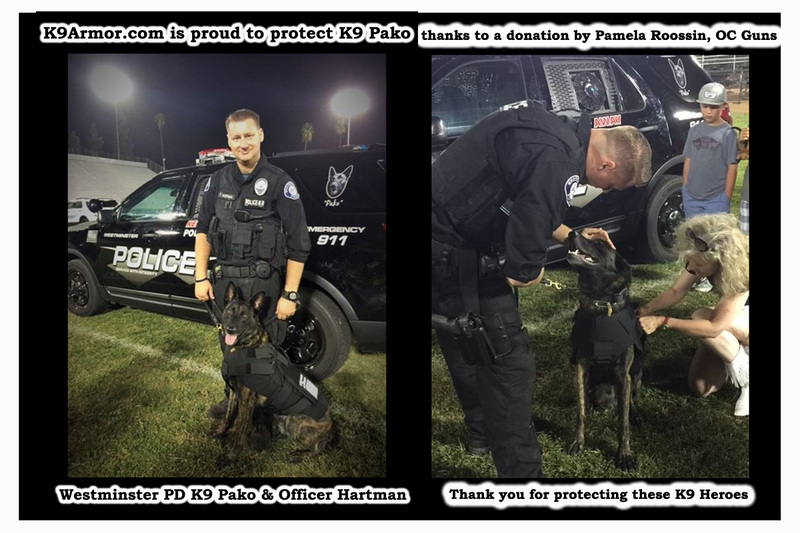 K9 Heroes and to an anonymous angel who donated to protect K9 Reiko and again to protect Fullerton PD K9 Jax at the Orange County Police Canine Association 2015 trials. December 25, 2015 and January 15, 2016 we received donations from the anonymous angels and friends to protect West Covina P.D. K9 Ronin! Congratulations West Covina P.D. K9 Reiko wearing his Medal of Valor awarded by the city for surviving a gunshot to protect his partner, Officer Rodriguez. Thanks to donations to K9Armor.com we protect these K9 Heroes. 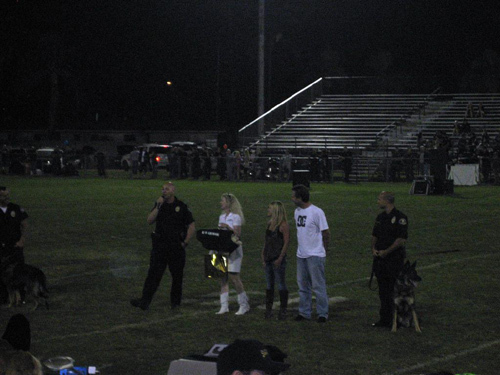 We gave West Covina PD K9 Rec and K9 Rocky K9 Armor bulletproof vests in loving memory of Riverside Sheriff K9 Sultan. Thank you OCPCA President & Placentia PD Officer Chris Anderson and former President Irvine PD Officer Bob Smith for granting us the honor to protect your beautiful police dogs and for inviting us to your awesome show! See more photos of the show and the beautiful dogs you are helping us save from Orange County on their web site www.ocpca.org. 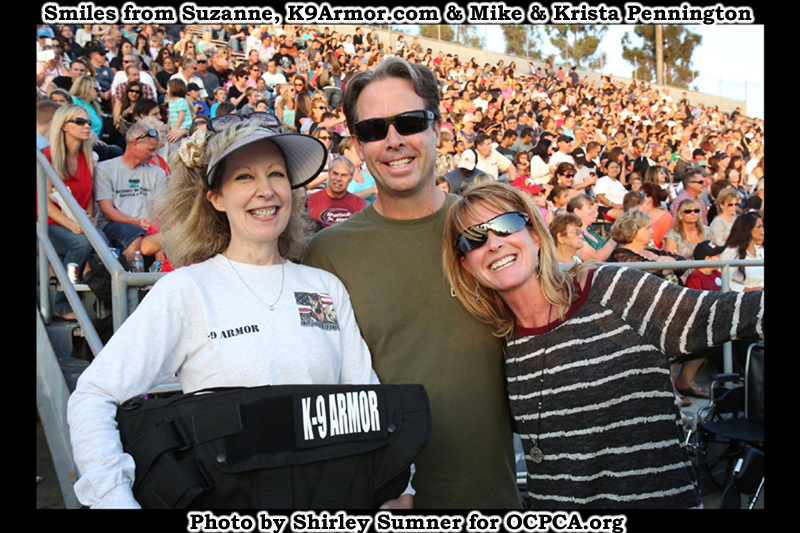 Our Angels Mike and Krista Pennington donated for a total of 15 OCPCA K9 Heroes they have protected with K9 Armor. We have the honor in 2017 of protecting Anaheim PD K9 Leo and Santa Ana PD K9 Pepper. In 2016 we had the honor of protecting Cypress PD K9 Pasko and Placentia PD K9 Ace and in 2015 the OCPCA President & Placentia PD Officer Chris Anderson's K9 Habo, Fullerton PD K9 Jax and Mueller and Rotar and Westminster PD K9 Pako. We are proud to protect Cypress PD Officers McBean and K9 Pasko and pictured here, Cypress PD Officer Mondon with K9 Sem and Placentia PD K9 Ace received K9 Armor thanks to donations by Mike and Krista Pennington. Sem and Ace gave hugs to K9 Armor cofounder Suzanne Saunders at the 2016 OCPCA K9 Benefit Show. Photos by Placentia K9 Assoc. Christina Marbrey. We are proud to have protected Orange County K9 Heroes including Anaheim PD K9 Bruno and Halo and Cisko and Ares and Guenther and Krieger, Cypress PD K9 Sem, Fullerton PD K9 Jax and Mueller and Rotar, Huntington Beach PD K9 Xavi, Santa Ana PD K9 Puskas, Orange PD K9 Lycan and Manhattan Beach PD K9 Bozi (pronounced Bozzi). We met an Anonymous Angel who donated for West Covina PD K9 Reiko and came all the way to Orange County Police Canine Association trials to donate for a second vest. Friends donated as their birthday present at the request of Pamela Roossin, co-owner of OC Guns. Thanks to donations of over $900 we protected more Orange County K9 Heroes. Come by their store to see their selection and support them collecting donations to support your local K9 Heroes. Thank you Riverside Sheriff K9 Association we are honored to protect your K9 Heroes. 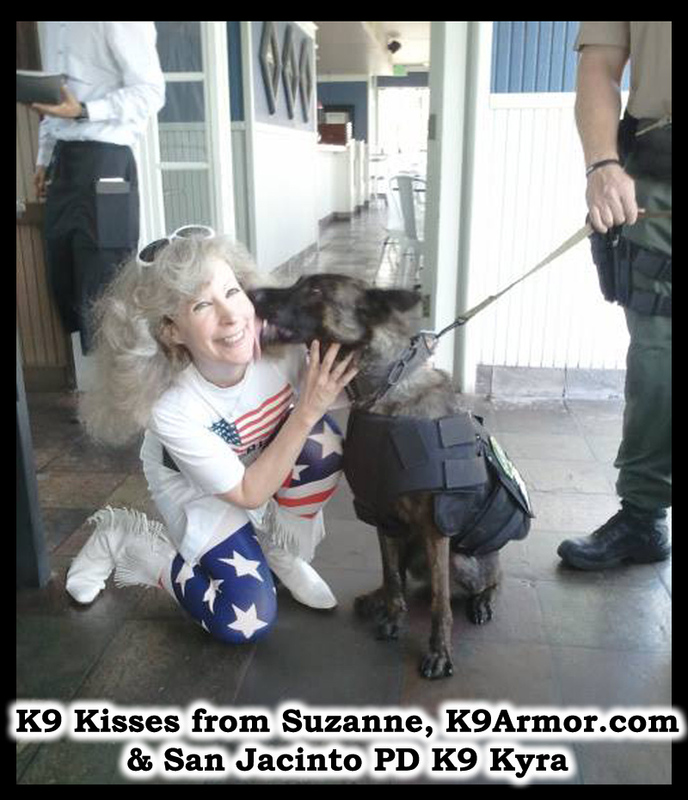 K9 Kisses from Suzanne, K9Armor.com cofounder and Riverside Sheriff - San Jacinto PD Deputy Wallace and K9 Kyra. Photo by Rebecca Daugherty who also donated for a K9 Armor vest. 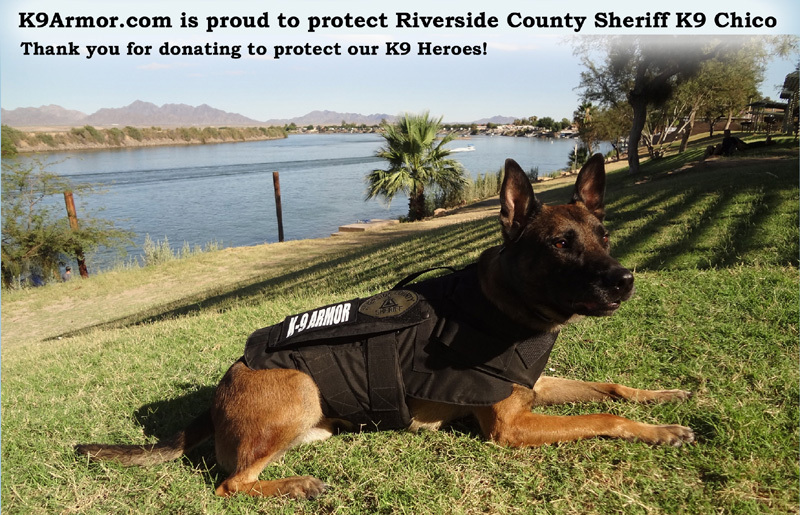 Thank you Rich Holt of Greenstone Materials for donating $900 to give a K9 Armor vest to Riverside Sheriff - San Jacinto PD K9 Officer Wallace for his new partner K9 Kyra in loving memory of his first K9 partner Riverside Sheriff K9 Sultan EOW 01-21-2015. Riverside Sheriff - San Jacinto PD Deputy Wallace and K9 Kyra. Photo by Rebecca Daugherty who also donated for a K9 Armor vest. Owners Patrick and Kay Moody and Assistant Manager Christienne Hudson and her beautiful family all pitched in to hold a Raffle with neat prizes and Dog Wash Charity Day that raised an Amazing $1400.00! We also met some very generous locals and their very lovable canine companions and Riverside Sheriff - Temecula PD Deputies Cramer and K9 Rudy and Corporal Staat and K9 Astin, came down to shake paws and get a wash! 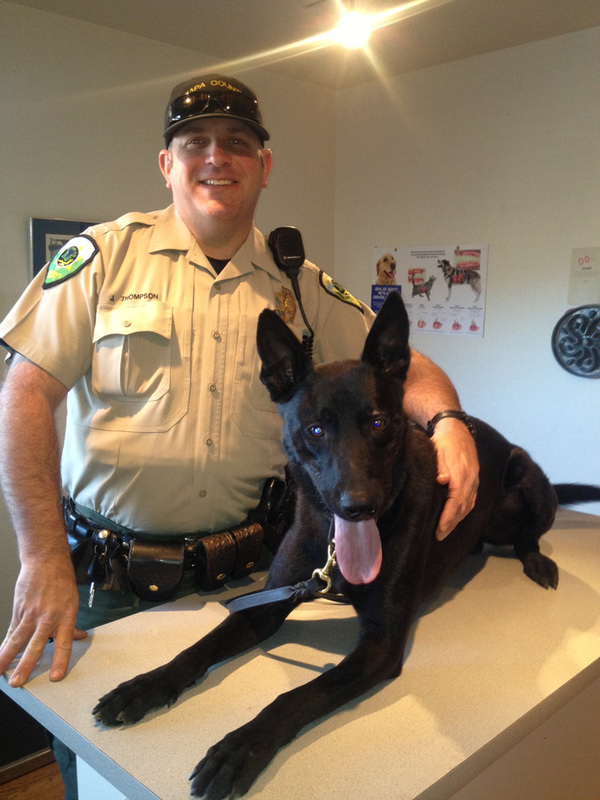 When K9 Rudy retired, Deputy Cramer received a K9 Armor vest for his new K9 Kayla. Thanks also to the kind veterinary experts of VCA El Rancho Animal Hospital of Temecula who came to show support and give prizes and the Hot Dog Ladies who supplied delicious treats for the human volunteers paid for by the generous Dogtopia owners. 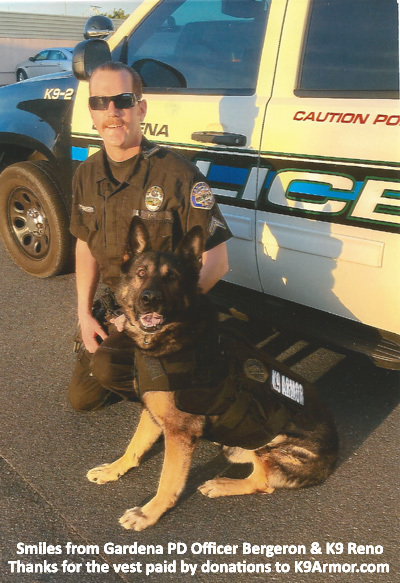 Thanks to fabulous reporter Kate Brown for her Windsor Times article which inspired Windsor residents Paula and Scott Rymer to donate $900 for K9 Scout and another Windsor local Virginia, in loving memory of her brother, John McKinney that K9 Sasha should also have a vest. How generous of you and how grateful we are to our lovely sponsors. The Deputies and their families send nose kisses of thanks for these police dogs guard the prisons, the streets and at home, their beloved families. That allowed us to give a vest, honor our sponsors and bring K9 Scout and Sasha on board. Hugs from Sonoma Sheriff K9 Sasha and Scout. 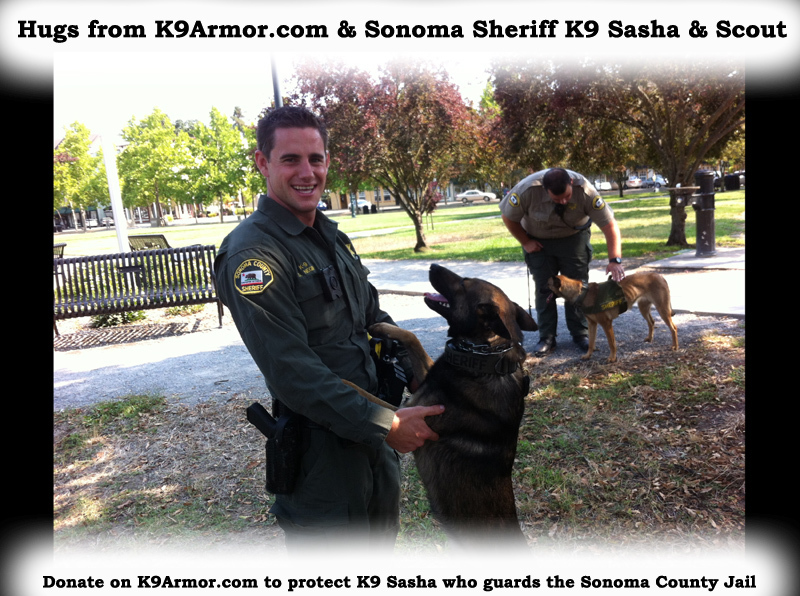 Donate on K9Armor.com to protect K9 Sasha (in the background) who guards the Sonoma County Jail. 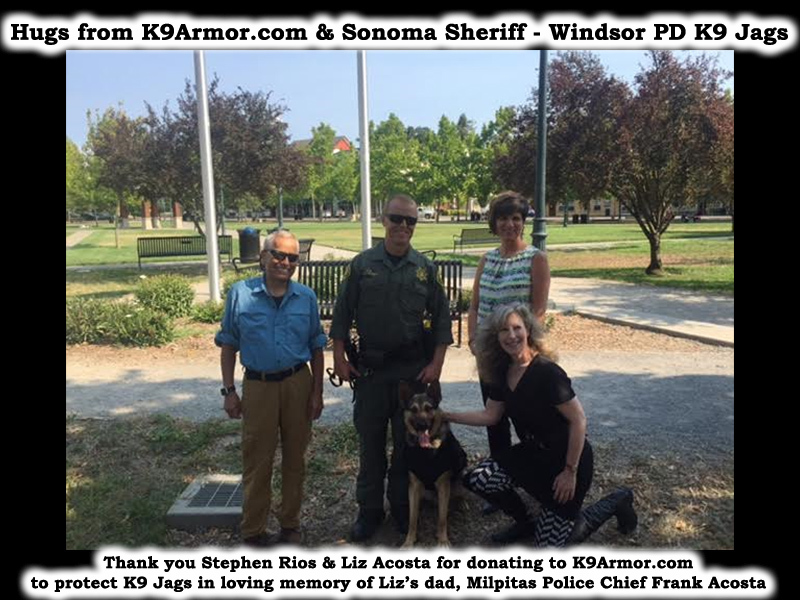 Thanks to Sonoma Sheriff K9 Association & Windsor Police Chief Chris Spallino for bringing together a show of support of the magnificent Sonoma K9 Heroes to present a vest to Windsor PD K9 Jags thanks to a donation by Windsor residents Liz Acosta & Stephen Rios from Windsor, CA for donating to give a K9 Armor vest to protect Sonoma Sheriff - Windsor Police K9 Jags in Loving Memory of her dad, Milpitas Police Chief Frank Acosta. 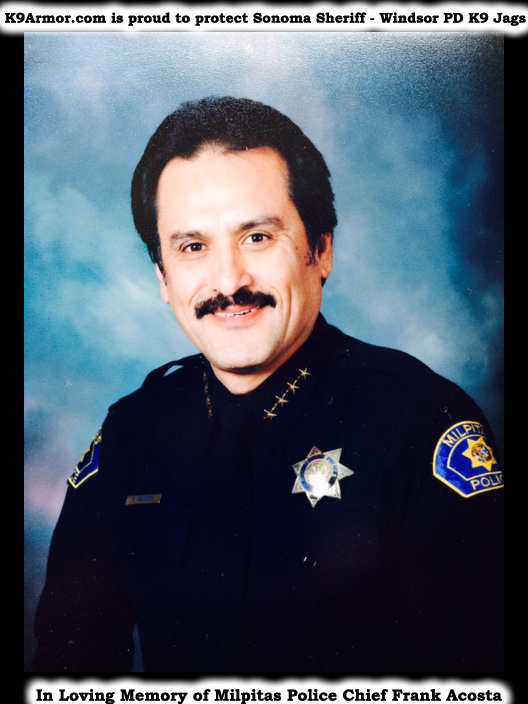 In Loving Memory of Milpitas Police Chief Frank Acosta. Thanks to the Hawthorne Police K9 Assoc. for the honor of protecting your K9 Heroes. 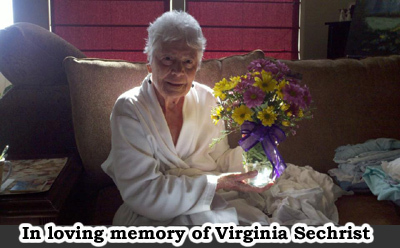 Thank you Victoria Sechrist Boydd for donating with her sisters $1600 in loving memory of their mom, Virginia Sechrist. 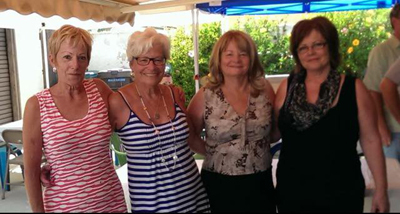 Daisy, Vicky, Violet and Diana, the Sechrist Angels who donated in loving memory of their Mom, Virginia. Hawthorne PD Officer Galindo and the daughters of Virginia Sechrist who donated $1600 to protect the K9 Heroes of Hawthorne. Photo by Victoria Sechrist Boydd. 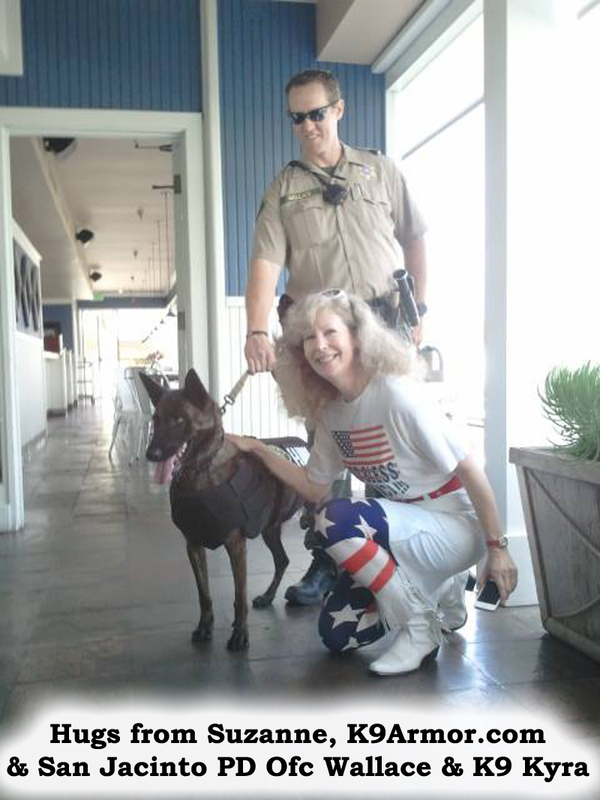 Hugs from the beautiful Portofino Hotel Marina in Redondo Beach with Suzanne Saunders, K9Armor.com cofounder & Hawthorne PD K9 Heroes Officer Galindo & K9 Chicko with Victoria Sechrist Boydd & Rebecca Daugherty. K9 Chicko wearing his K9 Armor vest thanks to a donation In Loving Memory of Virginia Sechrist from her family, & loving friends. 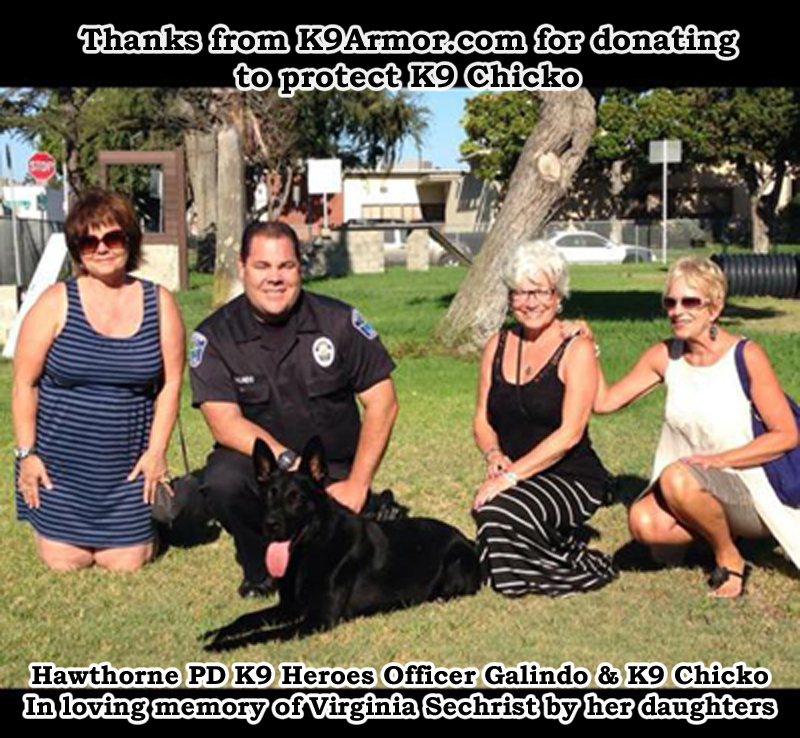 Donate $1800 for two more vests for K9 Heroes on the Hawthorne PD SWAT Team. 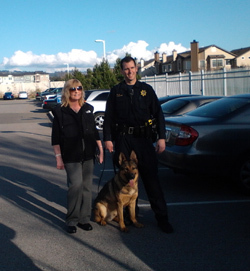 Thank you Napa Police K9 Unit for the honor of protecting your K9 Heroes with K9 Armor. 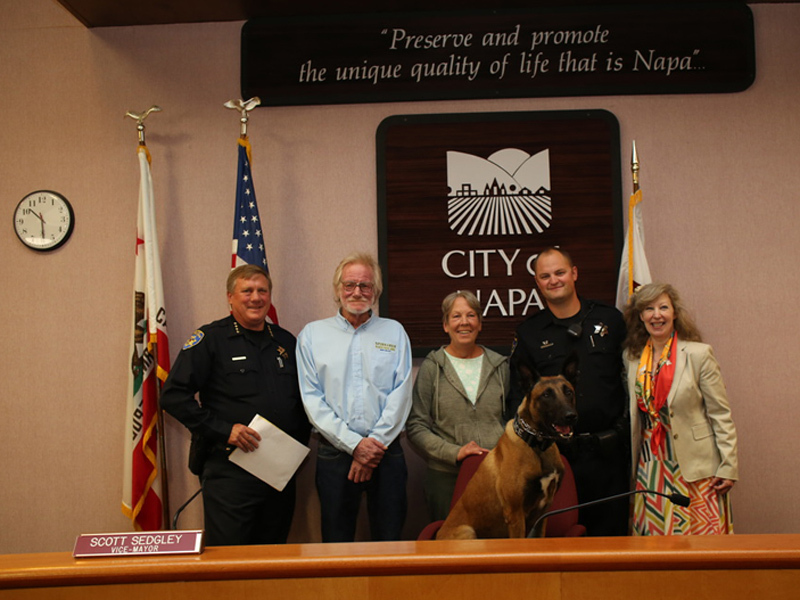 Thank you Napa Police Chief Potter and Lt. Debbie Peecook for inviting us to Napa PD K9 Rocky's swearing-in ceremony July 28, 2015 at Napa City Hall. 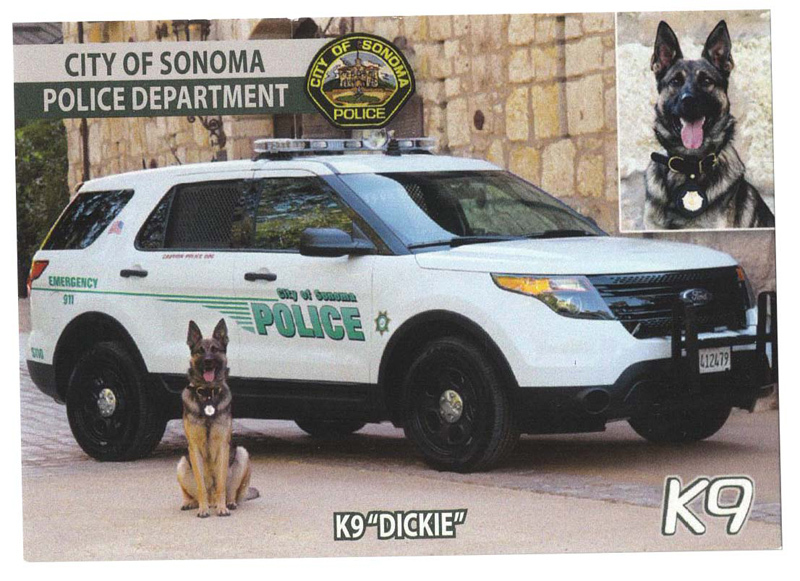 Thank you sponsors Sheri and Thomas Hundley, owners of Spinnaker Electric in Napa, for donating to protect Napa Police K9 Rocky. 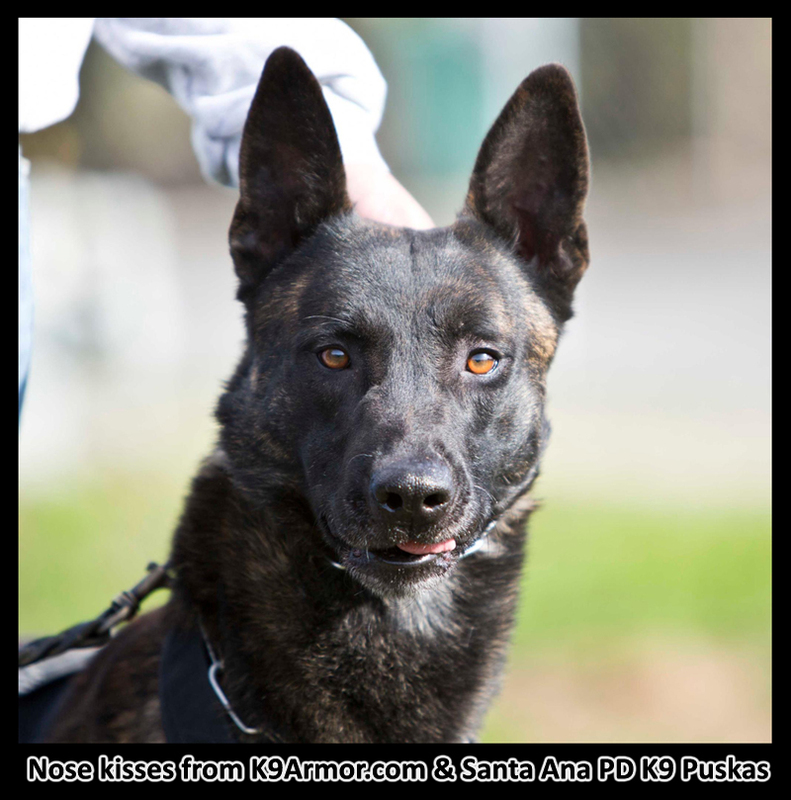 Thank you Ms. Maureen O'Donnell of Torrance, for $900.00 to protect Torrance PD K9 Nico! 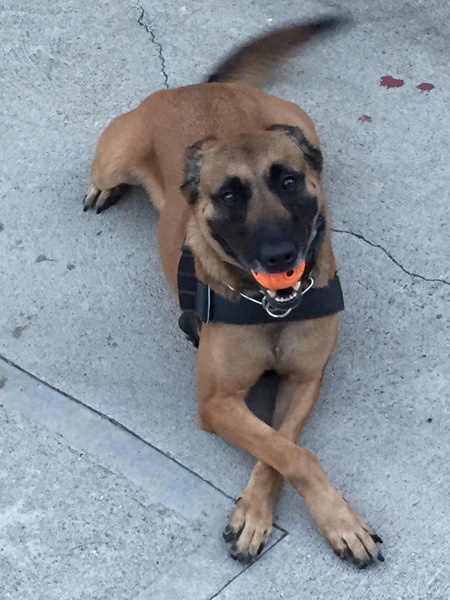 Thank you Judy Kline, who happens to be Officer Lara's mother-in-law, and who encouraged a fundraiser by her students of Bishop Montgomery High School in Torrance, CA, for donating $545.50 to help toward protecting Torrance Police K9 Nemo. We used collections of donations especially at Christmas to make up the rest to donate a vest to Officer Lara for Nemo, the K9 partner he depends on with his life. Hugs from Torrance Police Officer Lara and K9 Nemo wearing his bulletproof vest with K9Armor.com co-founder Suzanne Saunders. An anonymous angel donated to the Riverside Police Officers' Association for one vest to Riverside PD. Many thanks to a collection of donations raised by Steve Johnson of Riverside, thank you Steve! 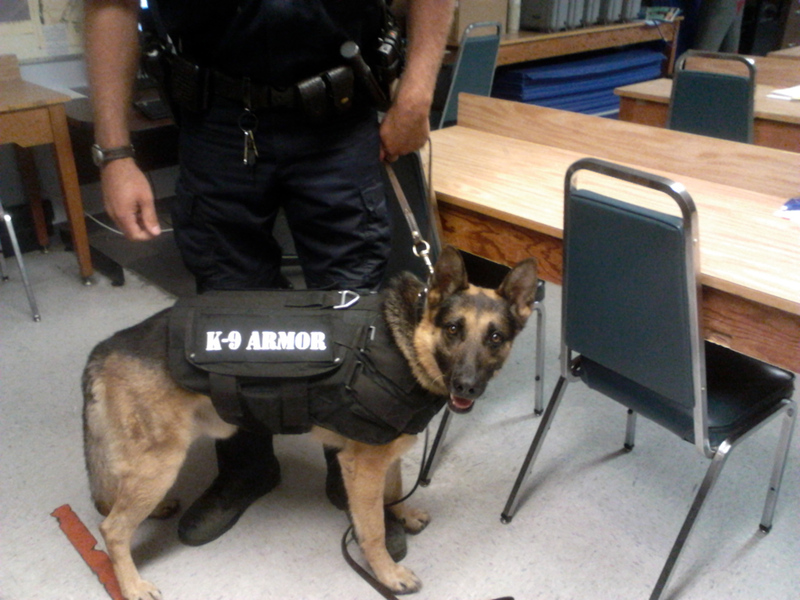 Riverside County Animal Control Officer Tiffany Fuller also promotes K9 Armor on Facebook. Thank you Tiffany. Follow their Facebook page What's going on in Riverside County. Thank you Connie Mlynarski, we will protect three K9 Heroes and inspire more people to donate to protect future K9 Heroes who will need K9 Armor vests. Thank you beautiful Mission Inn in Riverside, for hosting our K9 Armor Vest Presentation ceremony and providing refreshments in a quiet, sacred space in the Oriental Garden to give these vests in loving memory of Riverside Sheriff K9 Sultan. 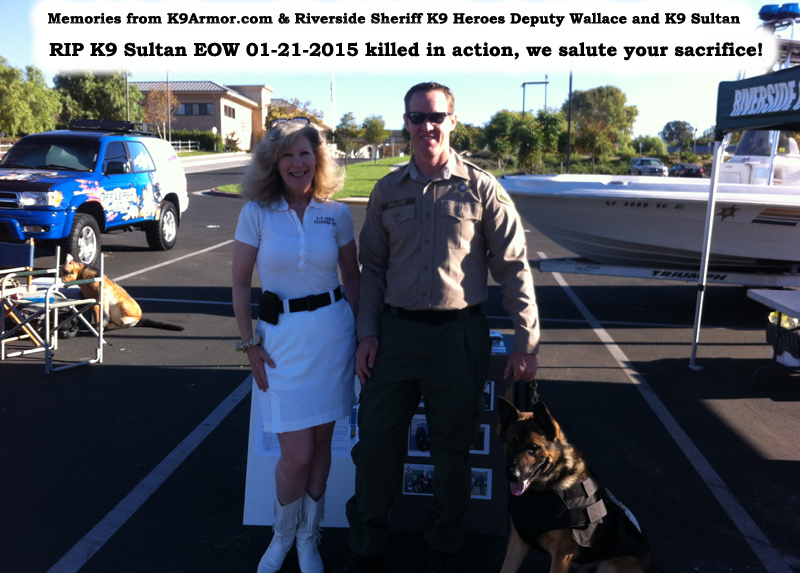 Sultan was shot and killed in Hemet on January 21, 2015. 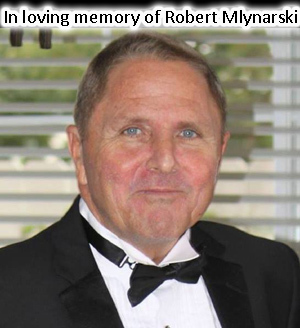 We received a donation of $2625 from Connie Mlynarski for 3 vests in loving memory of her husband, Robert Mlynarski. and Ruth Ramirez, Oakmont Branch Manager for $750 in 2011. 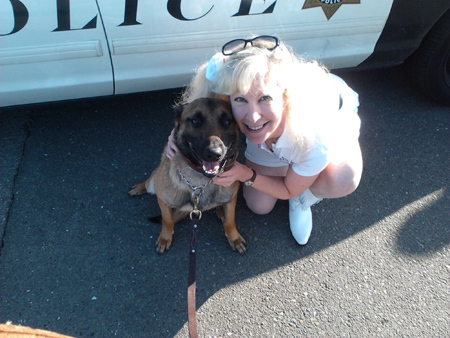 March 2015 Sandy donated $500 for the K9 Heroes of Central California from Stockton to Ventura. We just gave a bulletproof K9 Armor vest to protect Bishop PD K9 X-ray and we gave ten K9 Armor vests to Stockton PD including one for their newest K9 Road Warrior K9 Rex. We are raising donations for three new Stanislaus County Sheriff K9 Heroes, honored to have given ten K9 Armor vests to their K9 Heroes. 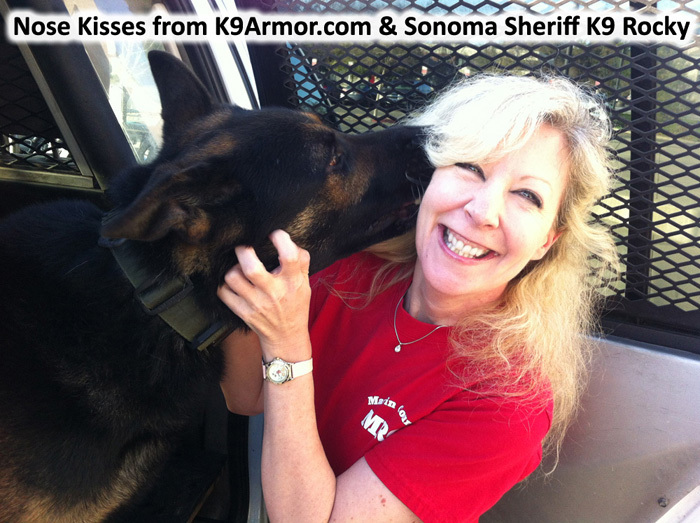 In 2011 Ruth donated for a K9 Armor vest for Sonoma County Sheriff K9 Axl who gave nose kisses of thanks to Suzanne Saunders, Co-Founder of K-9 Armor. Many thanks to Stephen Hall for this excellent photo. Special thanks to Ruth Ramirez, Oakmont Branch Manager of Wells Fargo for sponsoring K9 Axl. Thank you Robert Young & wife Tracy, who stopped Sonoma County Sheriff Deputy Mason on the street and offered to sponsor a K9 Armor vest for K9 Rocky. Then they donated a second time for K9 Falko. Now in 2014 they donated $1000 to protect the next K9 Hero who needs a K9 Armor vest. Awesome of you! 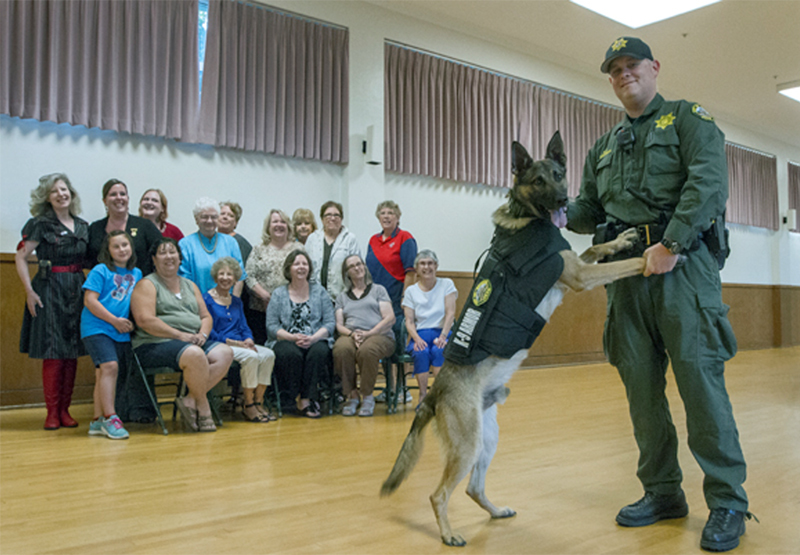 We also donated bulletproof vests to Sonoma Sheriff K9 Heroes Axl, Karl and Yak, who inherited Axl's vest after Axl retired. Happy Birthday Savannah Stevens of Cupertino! Thank you for your donation of $195.00 on September 29, 2014, starting with $110 in 2010 and $80 June 2011 and $135.00 on August 5, 2013. Your donations in lieu of gifts from your friends, helps us to succeed protecting all the K9 Heroes you see in the pictures that follow on this page. Savannah's mother is a veterinarian and so we thought you would appreciate the following collage. Paid for by his veterinary technician Nadya Simon and delivered by K9 Armor cofounder Suzanne Saunders at the St Helena Veterinary Hospital on Deputy Thompson's birthday. 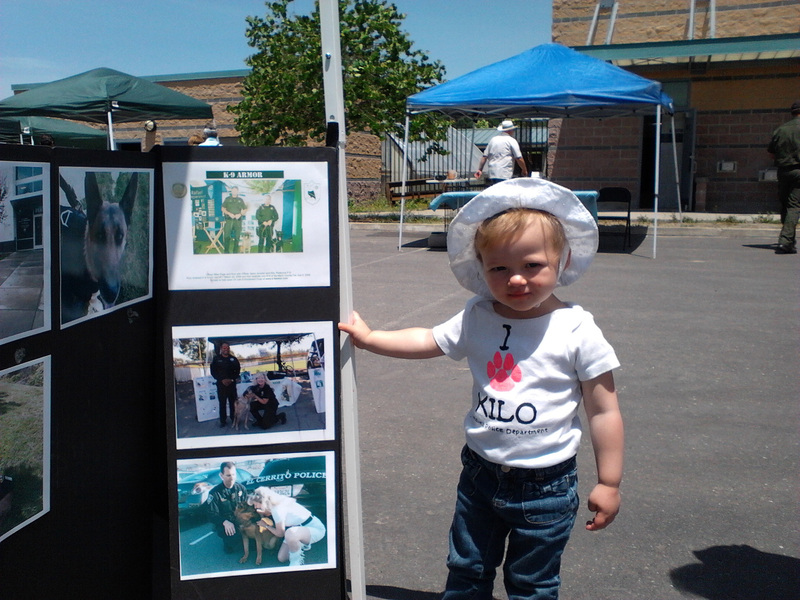 A fitting tribute with pictures taken by Dr. Gold's wife who donated together to protect St. Helena Police K9 Djino. 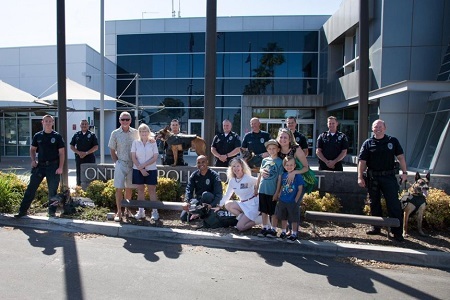 Thanks to Savannah in Cupertino and her friends, instead of a birthday present when she turned nine years-old, she and her friends made a donation of $110.00 to help protect all the police dogs who send nose kisses of thanks! Every year since then she's raised funds in lieu of a gift again. What a great example you set for everyone of all ages around the world, generosity is a virtue in every language and the donations from you mean the gift of life for the K9 Heroes we love! 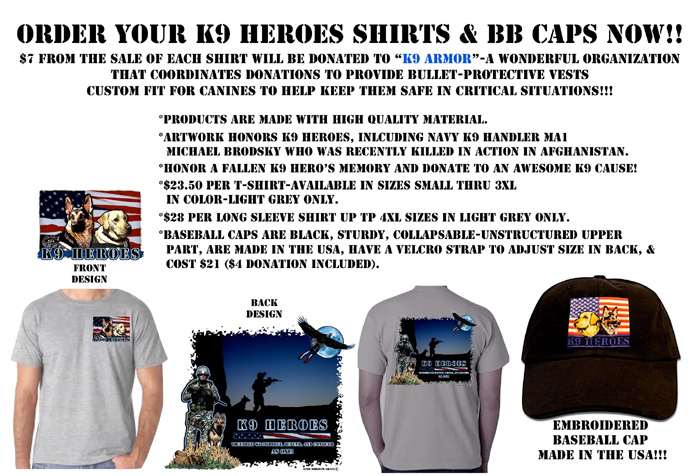 Order K9 Heroes Shirts and Caps click to open Rose Borisow web site GraFX. Thank you Officer Rose Borisow, for donating your talents designing these beautiful shirts and hats. Purchase a hat or shirt from Rose, and a portion goes to K-9 Armor! 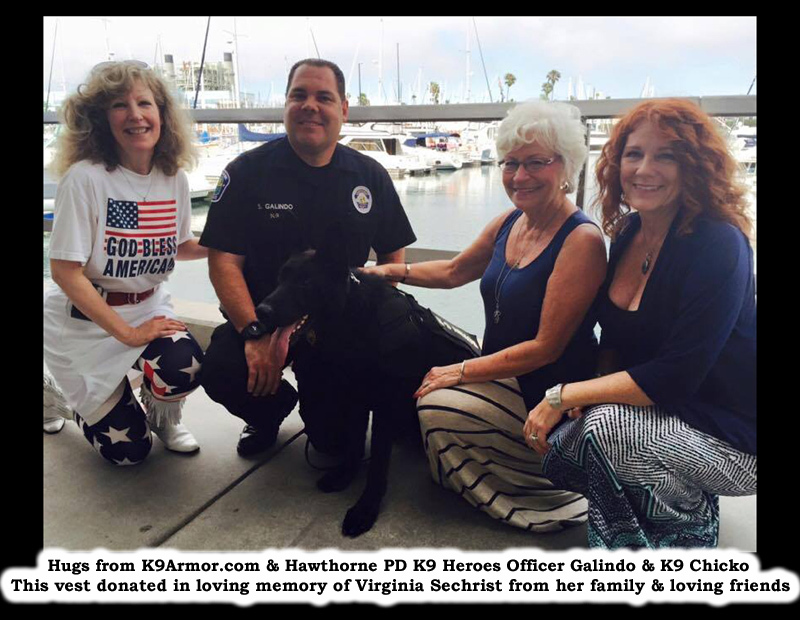 Thank you again Rose & Nicole Arbelo, author of K9 Heroes for raising enough donations to sponsor Kash with your Wish for a K9 Armor vest for Kash. Thank you Jamie Almon of Wild Rose Motors for placing a donation link on their web site. 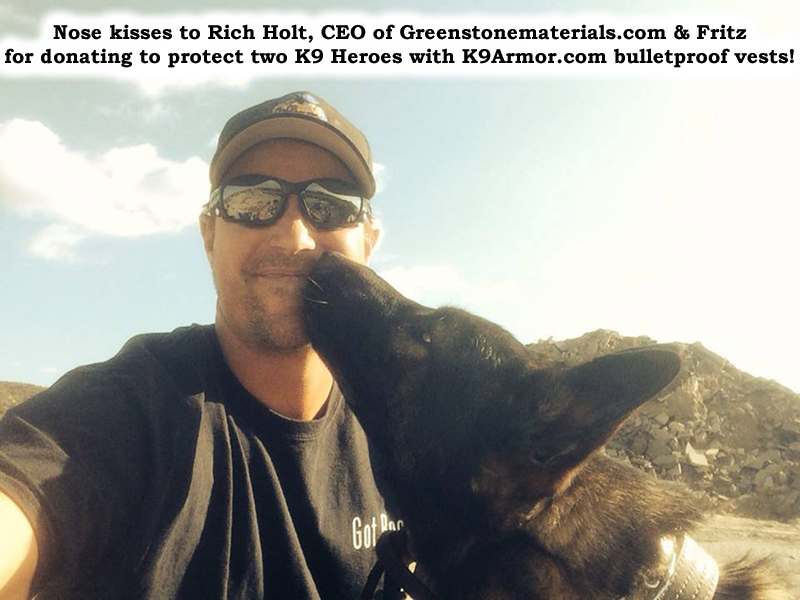 Thank you Rich Holt, CEO of Greenstone Materials Inc. for donating to protect three K9 Heroes who need it most. 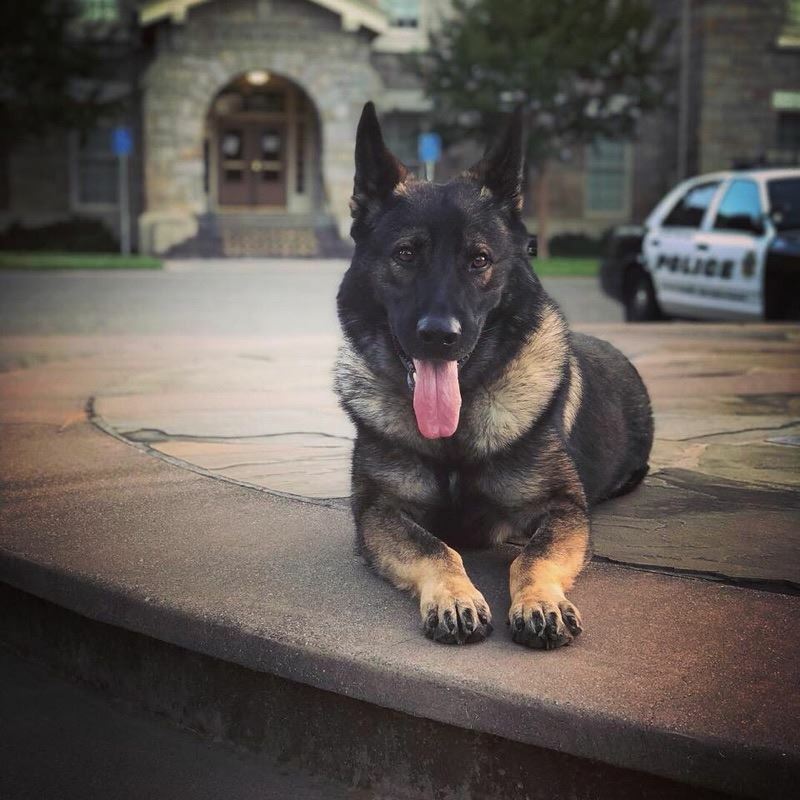 Bishop PD K9 Xray waited a year since a dispatcher named Jessica Scida contacted us on Facebook asking for a K9 Armor vest. A year later in October 2014 Rich Holt came to our table at the Orange County Police Canine Benefit Show. 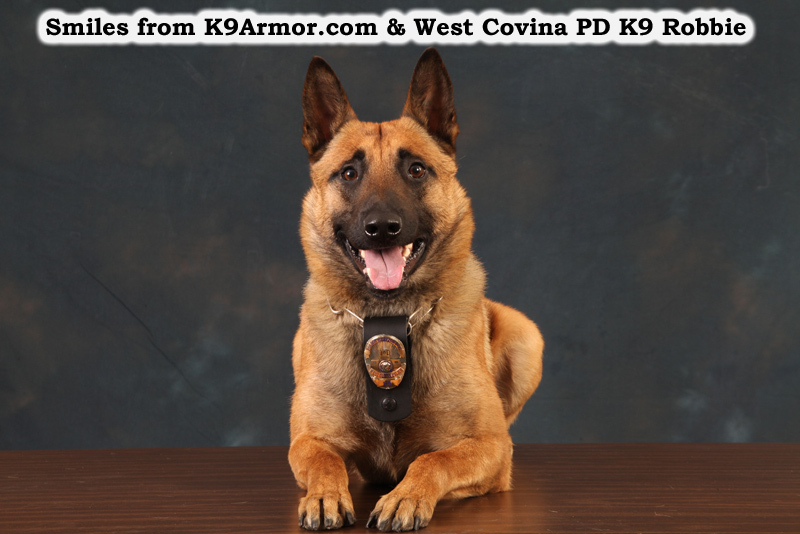 West Covina PD K9 Rec received a life-saving bulletproof K9 Armor vest!. 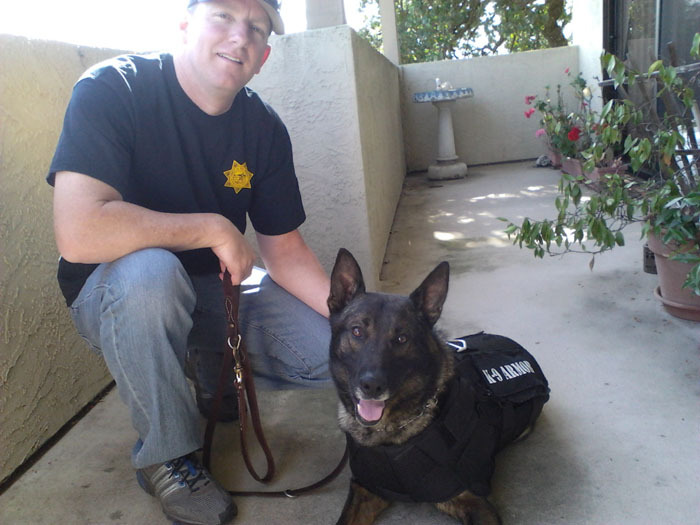 July 2015 we will give a vest to Riverside Sheriff - San Jacinto PD K9 Kyra. Bishop P.D. Officer Gillespie and K9 Xray from article in strongcitiesstrongstate.com. Thank you Friends of WCPD K9s for donating $875.00 for West Covina P.D. K9 Robbie! Status: Added October 30, 2013. 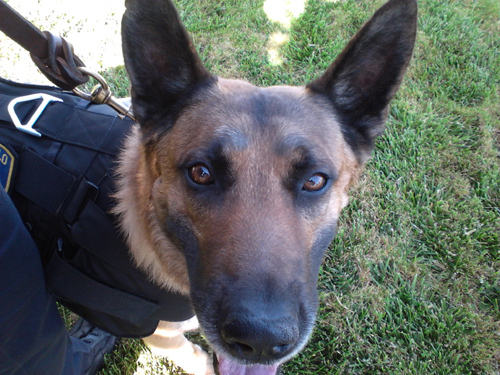 By October 2014 K9 Robbie had a vest but we need 2 more. 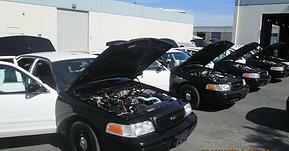 Donate to protect future West Covina PD K9 Heroes. Retail for each vest the officers wear is $1300, for officers on two legs or four. 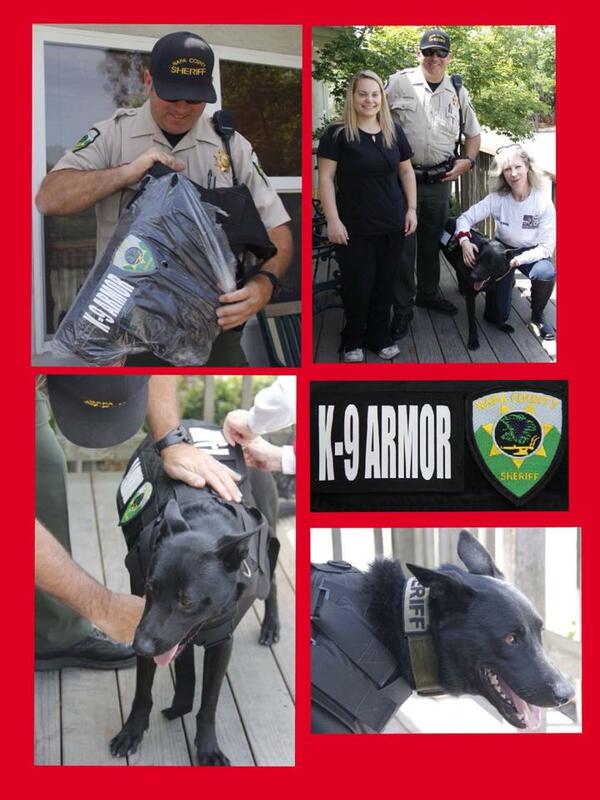 We give them the same Kevlar Level IIIA ballistic vests for FREE for all their K9 Heroes. Every law enforcement police dog in California qualifies for a free K9 Armor vest. Every $875 donation protects the police dog of your choice. Riverside County Sheriff K9 Chico. Photo by Deputy Jesse Deacon. 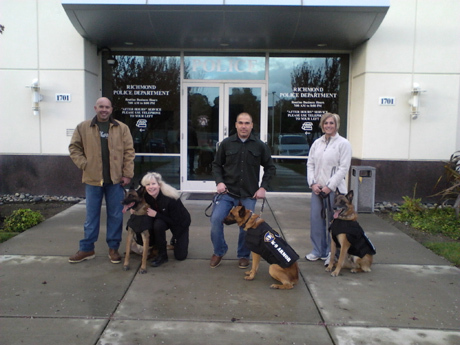 Thank you Todd & Judy Zervas for donating $1750 in December 2013 for two Riverside County K9 Heroes. Deputy Mark Wallace has been with the Riverside County Sheriff’s Department for eight years and has worked at the Indio Jail and the Hemet and San Jacinto Patrol Stations. While working for the Sheriff’s Department, Deputy Wallace has had the opportunity serving the communities of Valle Vista, Idyllwild, Anza, and the City of San Jacinto. 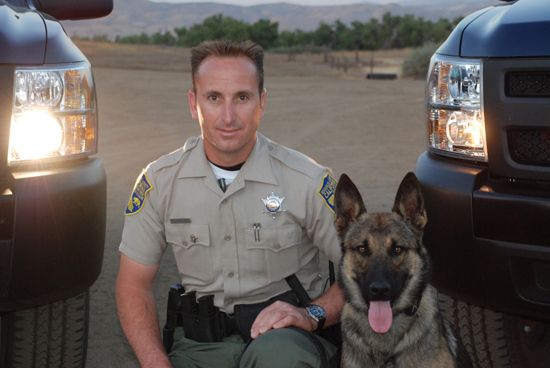 Deputy Wallace was the K9 Handler in San Jacinto with his partner, “Sultan”. Sultan was a two year old mixed Belgian Malinois / German Shepherd from Slovakia. Sultan was trained to locate hidden articles of evidence and to apprehend dangerous suspects. 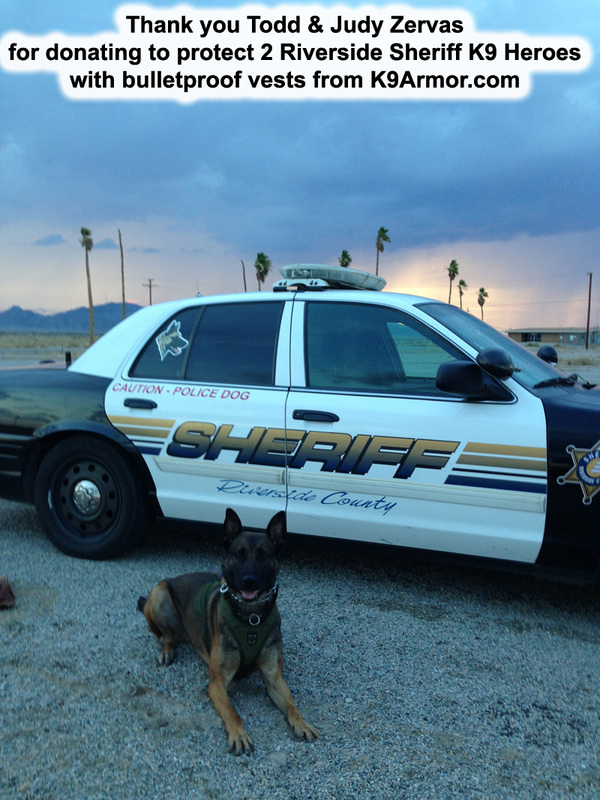 Deputy Wallace and Sultan patrolled the City of San Jacinto from November 2013 to January 21, 2015. On January 21, 2015 Sultan was shot in the neck and died soon after at a hospital. If a K9 Hero takes up the fight to join forces with Deputy Wallace, and if he needs a different size vest, we will replace it. Sultan took the bullet that would have killed his partner if hit in the same spot. 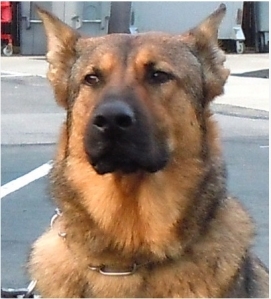 We salute your sacrifice Sultan, you were a true K9 Hero. Our sympathies and prayers to Deputy Wallace. 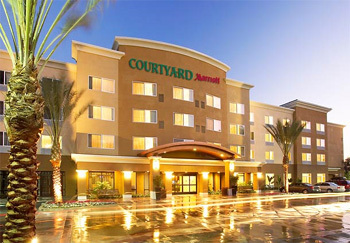 Thank you Stephanie at the Courtyard Marriott in Anaheim for free parking & extra special care. 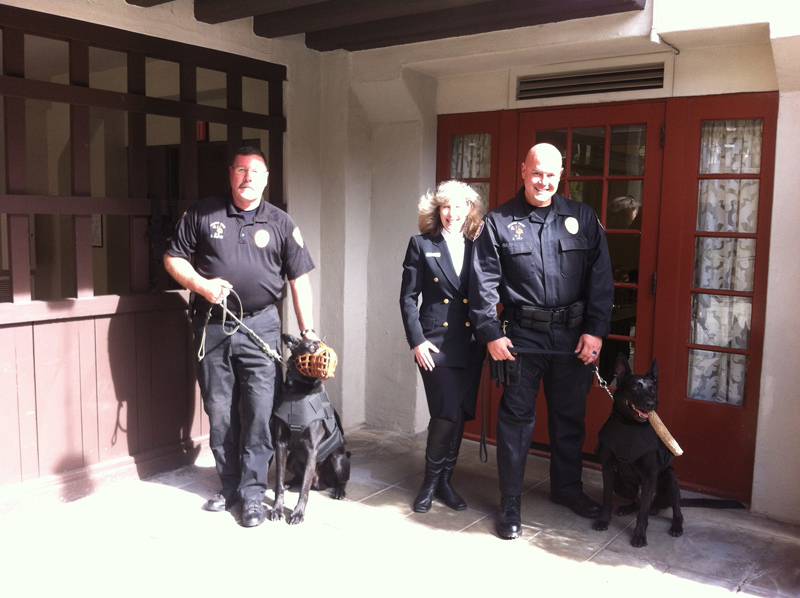 Stephanie supports the Anaheim PD K9 Team and appreciates we protected their K9 Heroes. 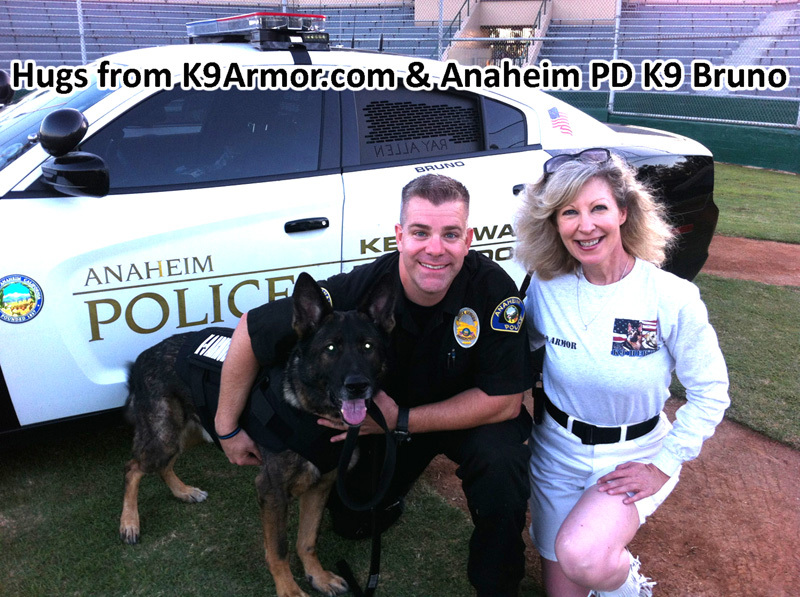 We give K9 Armor vests at the Orange County Police Canine Association yearly K9 Benefit Show at Anaheim Glover Stadium. 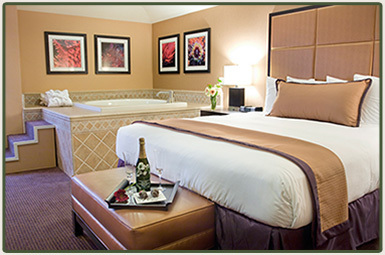 Follow the link from the picture to make a reservation at the Courtyard Marriott in Anaheim. Click "Marriott" to make a reservation at any Marriott Hotel. Many thanks to Mike and Krista Pennington of Foothill Ranch. Their first donation of $1750 protected Anaheim PD K9 Cisko and Huntington Beach PD K9 Xavi with K-9 Armor bulletproof vests. Another big thank you for a second donation of $1750 for Anaheim PD K9 Ares and Orange PD K9 Lycan. 2012 the Amazing Penningtons donated another $500 directly to Orange County Police Canine Assoc. for their program and all the good things they do for their police dogs, and another generous donation of $1750 for Anaheim PD K9 Guenther and Fullerton PD K9 Mueller. 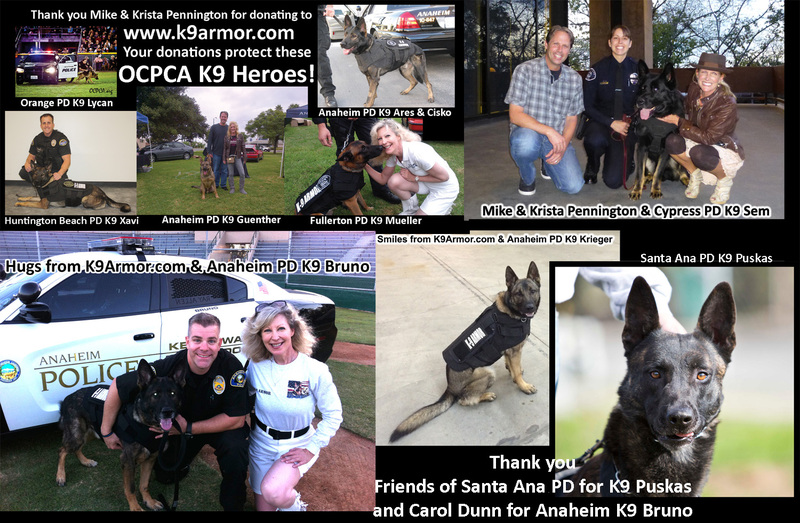 2013 our Superhero Sponsors returned and thank you Mike for taking a picture of Anaheim PD K9 Bruno, whose K-9 Armor vest was sponsored by another angel, Carol Dunn. Mike & Krista donated another $1750 for Anaheim PD K9 Krieger, the final police dog to need a vest on the Anaheim K9 Unit, and for Cypress PD K9 Sem. 2014 our Angels the Penningtons donated for three K9 Heroes. 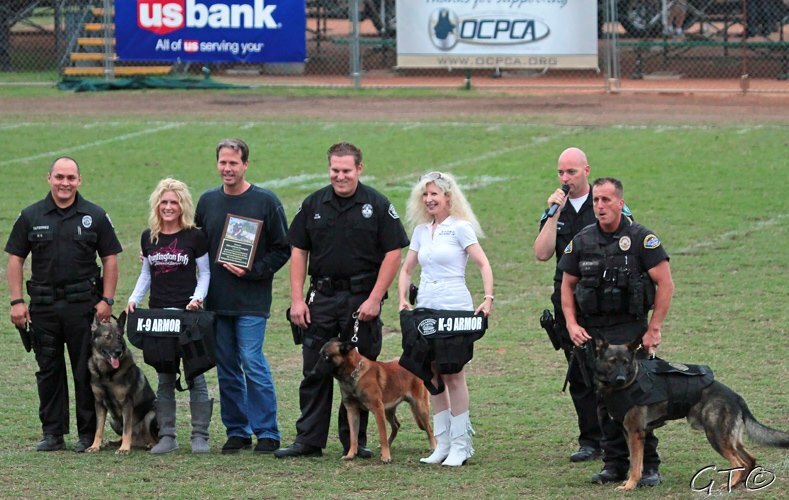 2015 they made a pledge for two more Orange County K9 Heroes. You are so generous, thank you angels Krista and Mike! 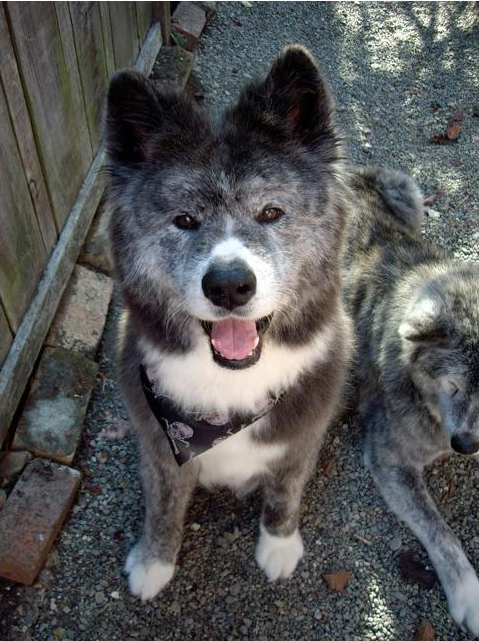 "We would like 1 vest to be donated in our name and the other to be donated as a memorial to our Akita Dakobe. Pictured left to right, Huntington Beach PD Officer Ricci and K9 Xavi, OCPCA former President Irvine PD Officer Bob Smith, K9 Armor Co-founder Suzanne Saunders, Sponsors and local residents of Orange County, Krista and Mike Pennington and Anaheim PD Officer Bonczkiewicz with K9 Cisko at the OCPCA Annual K9 Benefit Show 2011 at Glover Stadium, Anaheim, CA and (far right) Cisko wearing his new, K-9 Armor vest! Thanks to continuous and generous donations by the Penningtons they have provided over ten bulletproof vests to Orange County Police Dogs! Orange PD Officer Gutierrez with K9 Lycan, Krista & Mike Pennington who generously donated for six vests, Fullerton PD Officer Miller with K9 Mueller, K-9 Armor Co-Founder Suzanne Saunders, OCPCA Pres. 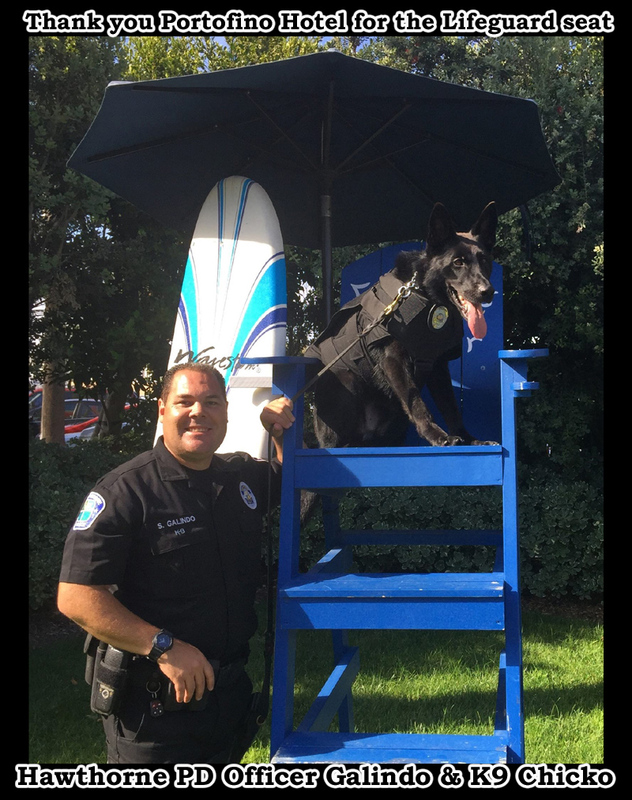 Bob Smith and Huntington Beach PD Officer Ricci with K9 Xavi. St Helena PD K9 Djino gives K9 Armor Cofounder Suzanne Saunders a kiss for his bulletproof vest. 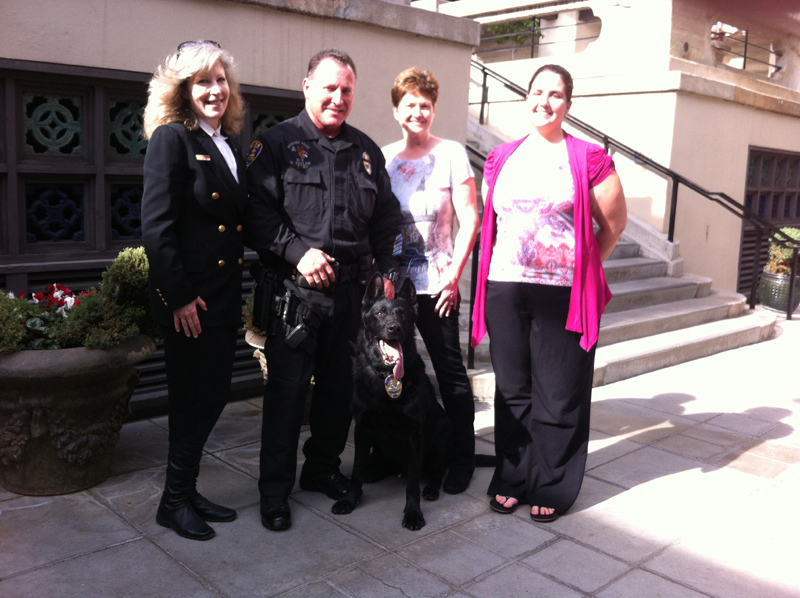 Thank you Ladies Auxiliary of the VFW (Veterans of Foreign Wars) for sponsoring Sonoma PD K9 Dickie. 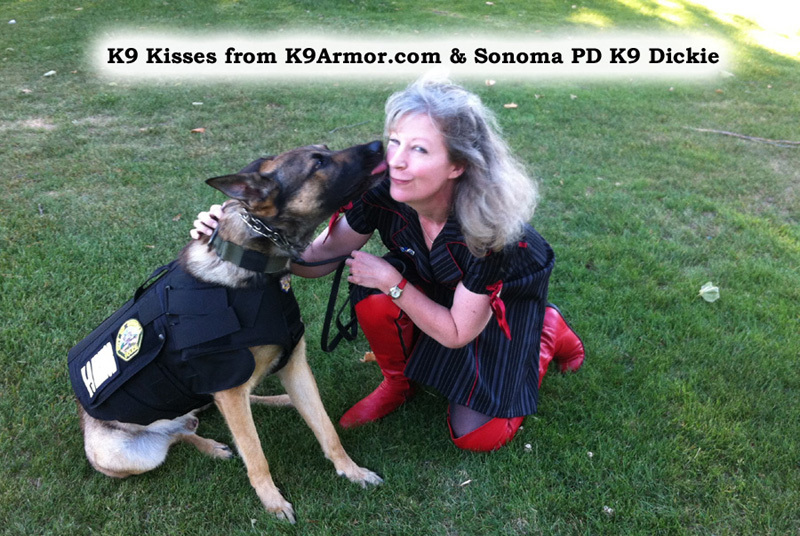 Sonoma PD K9 Dickie gives k9 kisses to K-9 Armor co-founder Suzanne Saunders. Thank you Ladies Auxiliary for your motto and this donation to honor the dead by protecting the living. God Bless All K9 Heroes. 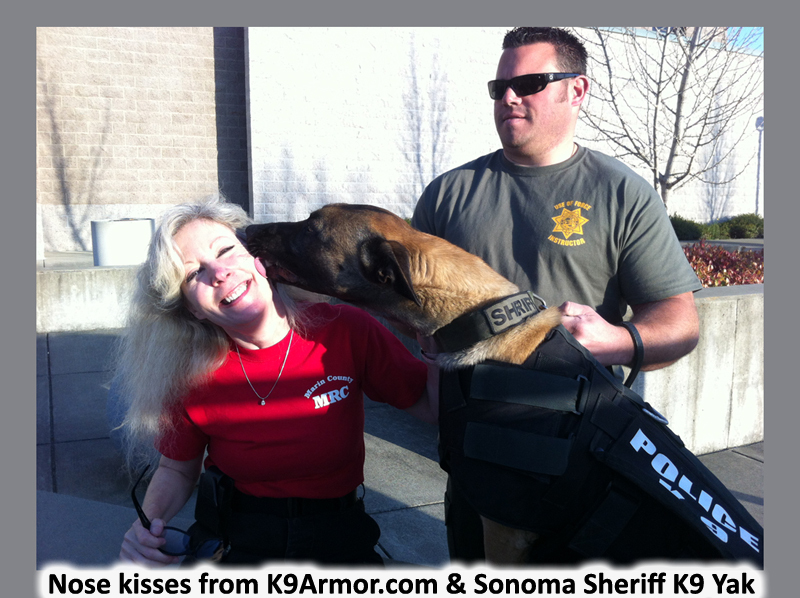 Sonoma PD K9 Dickie gives k9 kisses to K-9 Armor co-founder Suzanne Saunders. Photo by Sonoma P.D. Officer Jeff Sherman. Thank you Jeffrey Mullins for another $3500 December 2014 and $1750 in December 2013 and $1750 December 2012 for two Stockton K9 Road Warriors and $3000 in 2011 to protect Richmond PD K9 Nero and CHP K9 Dax covering the Bay Area including Alameda, Contra Costa, Sacramento, San Francisco, Stanislaus, San Jose the North Bay from Marin to Napa and Sonoma Counties. This generous donation will cover another four K9 Heroes. Each vest we order for the next local K9, we make sure to put your donations to work for your home turf to protect those who protect us! 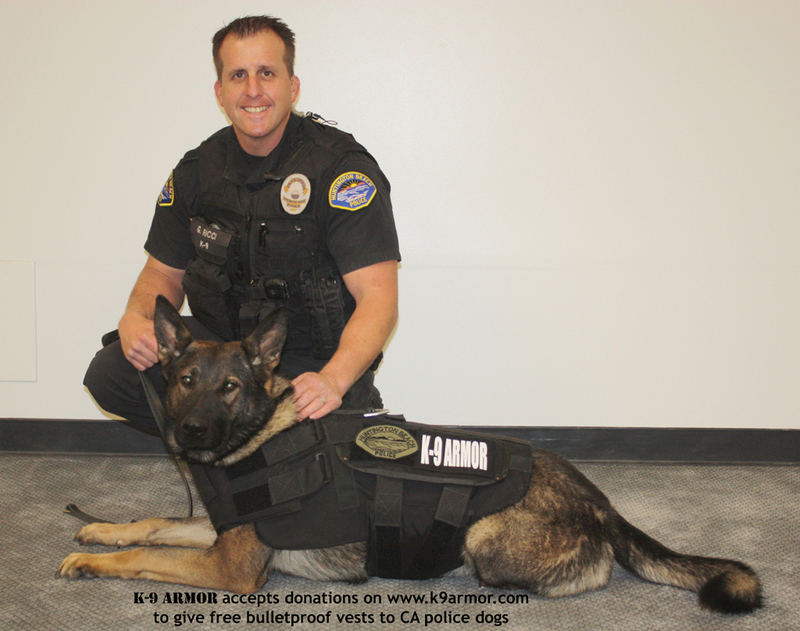 K-9 Armor covers all the magnificent police dogs of California with the only police standard quality bulletproof vests covering the abdomen, with Type IIIA at wholesale cost, each vest worth over $1300. Richmond PD K9 Nero received a K-9 Armor bulletproof vest thanks to Jeff Mullins! Thank you Dr Craig & Jennifer Eastwood for donating $250 on behalf of your family. Jerry & Zona, Brian, Glenna, Elaine, Jerrod, John & Melissa and daughters Angela & Sarah! Jennifer and Craig moved from California to San Antonio, Texas. They have family and friends across the country to the East Bay and West Hollywood, California, we thank all the Eastwood family and friends for their generous gifts. Thank you Mike & Linda Hirabayashi for $875 January 1, 2014 for making it possible to protect Zeus who waited a year. We make no profit from our fundraising, every dollar goes toward the next vest to a California police dog, everything we do is out of love for these K9 Heroes. Every police dog protected is another victory for K9 Armor. 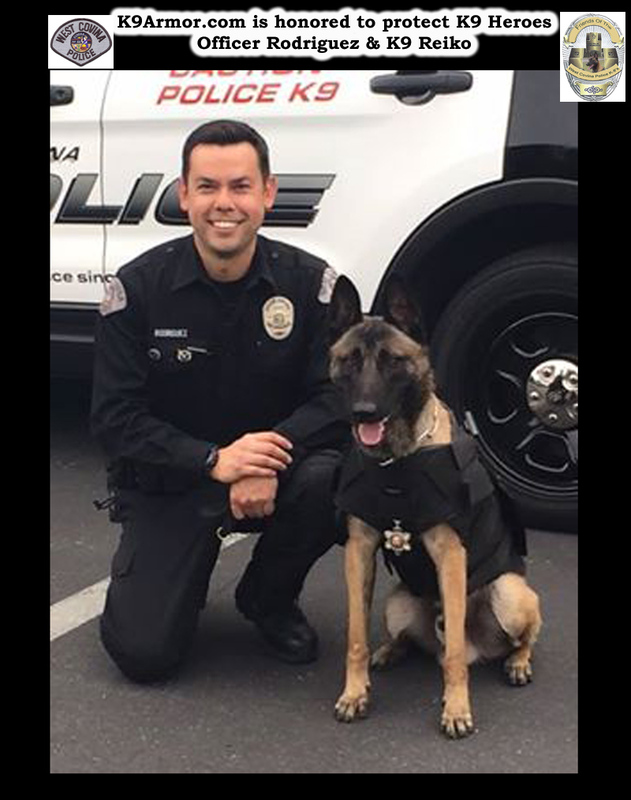 Thank you Mr Bill Cunningham, Pres/CEO Santa Ana Police Foundation for contacting us through Facebook to request a K9 Armor vest for Santa Ana PD K9 Puskas (pictured right). Thanks to generous sponsors who donated to the Santa Ana Police Foundation, K9 Puskas will receive a life-saving, K9 Armor bulletproof vest! 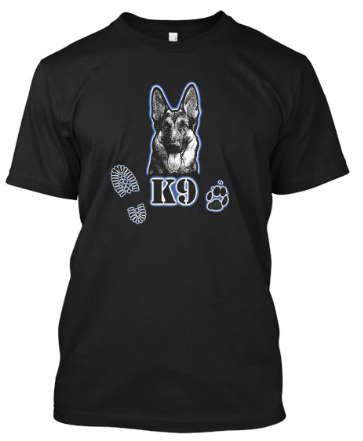 Thank you so much Law Enforcement Today for the article, click the image above to read & to artist Rose Borisow GraFX for this beautiful shirt, which you can buy on http://teespring.com/k9support donating a portion of profits to K-9 Armor. Love the dual foot prints showing protect the K9 & you protect his partner. 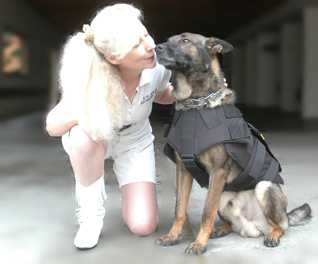 Each bulletproof vest costs $875 to protect the dogs who lay down their lives to protect us. God Bless All K9 Heroes! March 2013: Mobile Boutique brought in donations of $10 and $20 for $30 total, it all adds up! Thank you owner Samantha and her daughter who makes the jewelry, for wanting to help protect our local K9 Heroes! 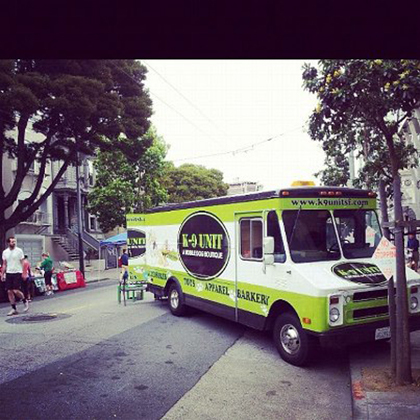 Look for their Mobile Store pictured here, offering K9 Treats and Jewelry in San Francisco and events around the Bay Area. 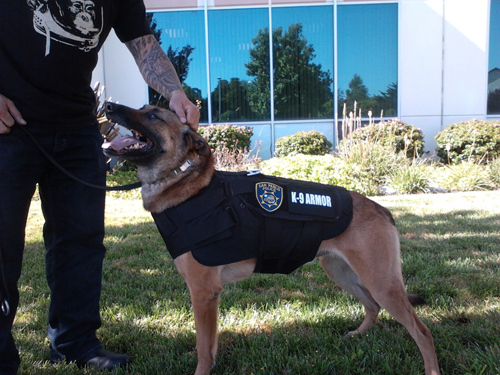 Thanks to Rose Borisow GraFX for creating & donating a portion of profits for sales of her K9 Heroes shirt worn by Suzanne Saunders, donating a bulletproof K9 Armor vest to San Pablo PD K9 Shadow. Thanks to Renee Bowler for sponsoring Shadow & Nicole Arbelo, Author of K9 Heroes & her fans on Facebook who helped us vest three K9 Heroes. 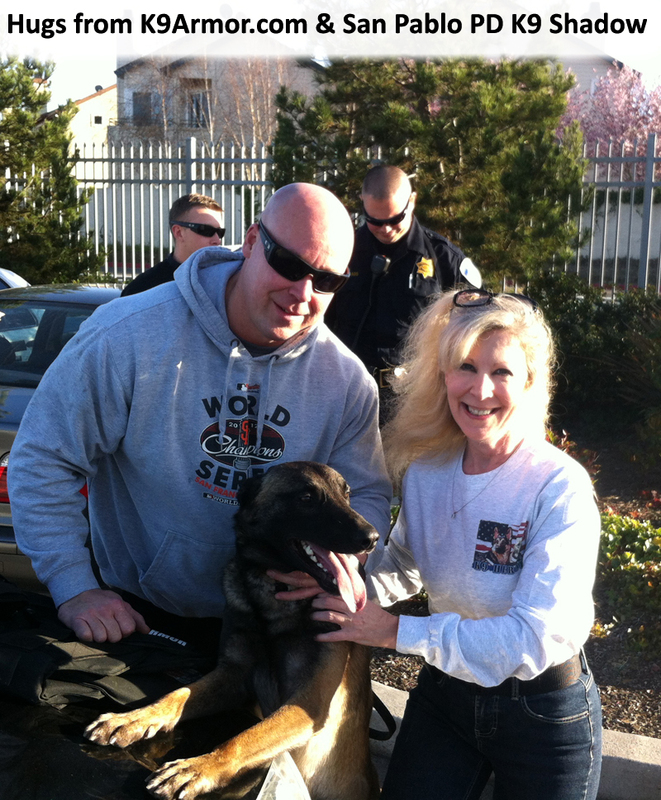 We sold on eBay to Carol Dunn, who sponsored eight K9 Heroes including Anaheim PD K9 Bruno. Bless you Carol! 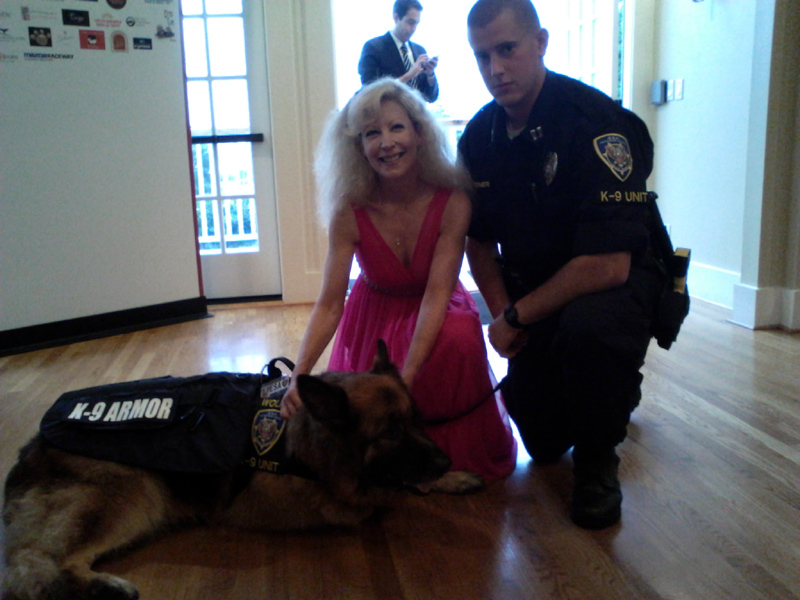 Deerfield Ranch Winery Hosts K9 Armor Elegant Events. Capture your own memories and visit their beautiful winery and order your own "Pawtraits" by Pawpawrazzi Pet Photography. February 2nd, 2013 Our Valentine Photography Event at Deerfield Winery was a success thanks to Pawpawrazzi Pet Photography by Anne Mary Schaefer for photography sessions with Trinity County Sheriff K9 Johnny & clients who donated to K-9 Armor. 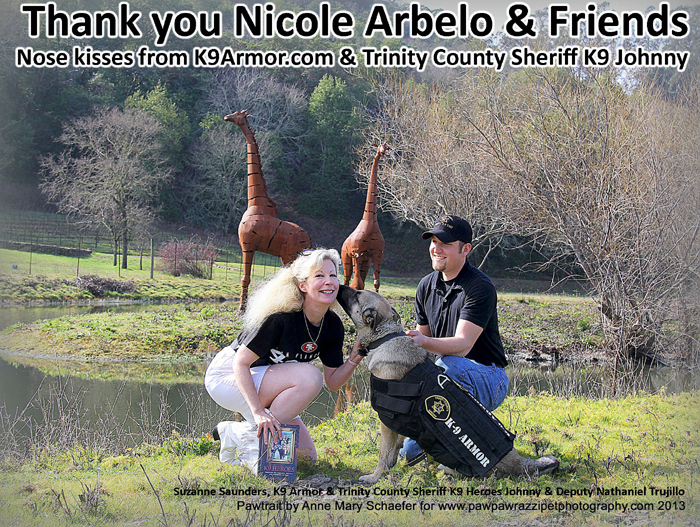 Thanks to Nicole Arbelo for her Causes Wish raising donations on her facebook page with fans of K9 Heroes. Saturday, September 10, 2011 Thanks to everyone who came down to the Release Party of "Running Dog Red" helping us raise $70 and shake paws with Walker, Deerfield's beloved winery dog, and all of his friends to taste his new wine and have a DOGgone good time. Thanks to Bill Klein and Addison and Nick and all the great staff for helping support local dog organizations: K9 Armor, Guide Dogs for the Blind, healthy dog treats from Ramekins with lots of yummy human food and we witnessed dog agility skills hosted by Tails-a-Waggin. 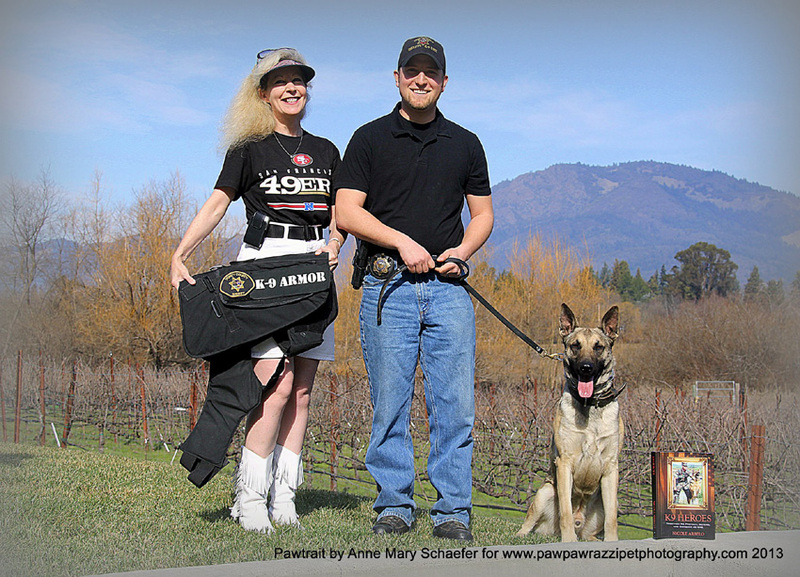 We donated a vest to Trinity County Sheriff K9 Johnny, our K9 Armor co-founder Suzanne Saunders wore a 49ers shirt from T&B Sports in San Rafael, to thank our local Super Bowl Champion team for their support. Watch our premiere video and download the song, many thanks to the creator of this film made by Nicole Arbelo, author of the best-selling book "K9 Heroes" with an original song written and performed by K9 Armor Co-founder, Suzanne Saunders with 100% of the profits going to K-9 Armor to give bulletproof vests to the those who lay down their lives to protect us. 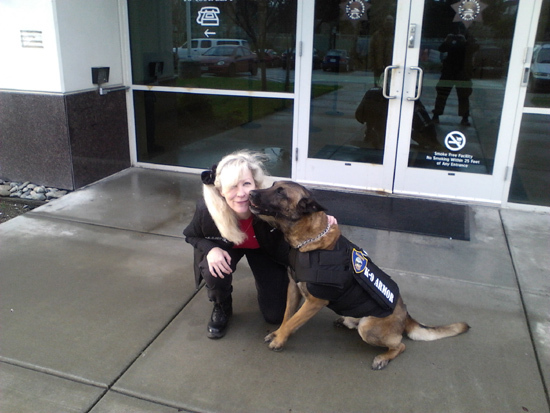 Thank you Nicole for Granting another Wish for K-9 Armor to vest Trinity County Sheriff K9 Johnny. Nicole helped raise enough for three vests on Facebook and our PayPal web site button. We gave two vests to the Stanislaus County Sheriff K9 Unit dedicated to fallen SCSO Deputy Robert Paris killed in the line of duty in April 2012, and in loving memory of Spc Cody Moore, who died in 2010 while serving in the Army. Thank you to all the generous sponsors we raised enough to give a K9 Armor bulletproof vest to K9 Sam and Smoke and now we raised enough for Trinity County Sheriff K9 Johnny. If you are a K9 Heroes fan reading this then you are Pawsome People! 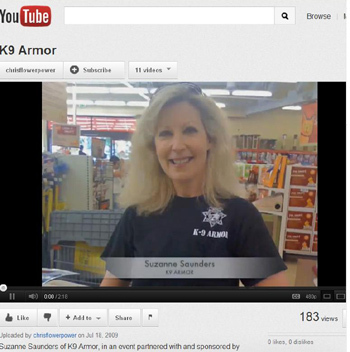 Click to see KCRA video and article K9 Armor for Stanislaus County Sheriff K9 Sam. 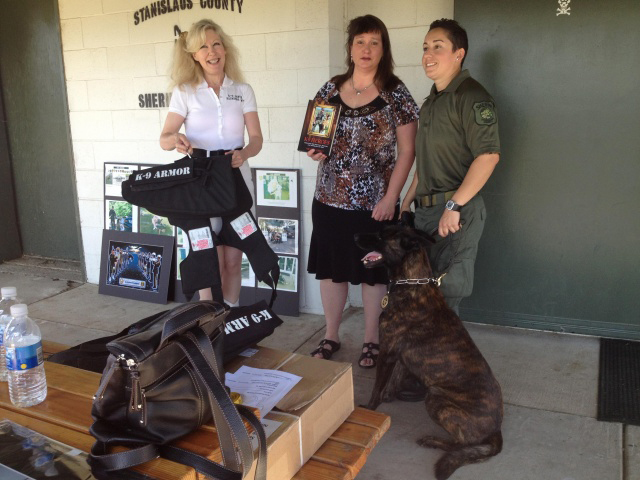 Suzanne Saunders holds the K9 Armor bulletproof vest for Stanislaus County Sheriff K-9 Sam. Nicole Arbelo holds her book K9 Heroes, her facebook fans helped raise the money to purchase the vest for Sam, held by Deputy Marcia Matos. Photo by KCRA Ch3 Modesto. 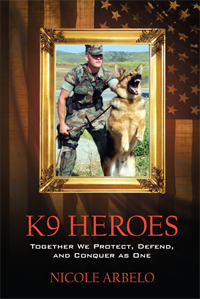 Click the book cover to view K9 Heroes on Facebook. Thank you Nicole for making a Wish come true for Stanislaus County Sheriff K9 Sam. Nicole's Wish for Sam on Facebook raised $735.00 and another $285 in donations to our web site. 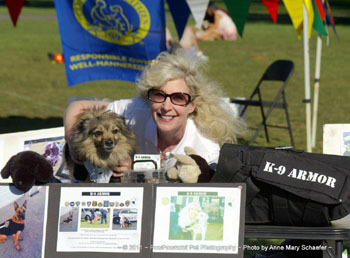 Thank you Kathy Hinds, Pres of MA Vest-A-Dog for donating cash and your time spent giving tips and liaison for other charities like ours in other States. Follow the Vest-A-Dog logo to see a list of other charities that give bulletproof vests. 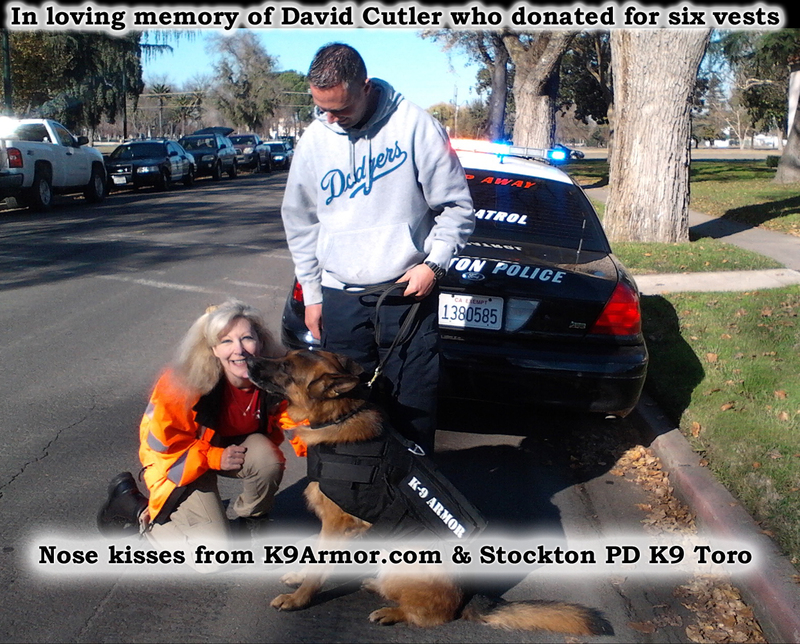 In loving memory of David Cutler, who donated for six K9 Armor bulletproof vests to protect the Stockton PD K9 Road Warriors. 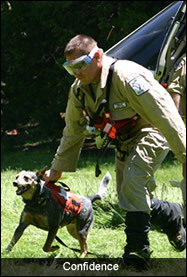 David donated in memory of his friend, Howard Stoltz, Placer County Sheriff Search & Rescue Volunteer with his K9 Scout. Thanks to returning sponsors Jeffrey Mullins for donating $1750 and Carol Dunn for also donating $1750 we were able to protect the entire team of Stockton PD K9 Road Warriors! 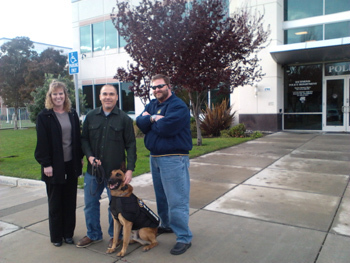 Rohnert Park PD K9 Kimo wears his K-9 Armor vest thanks to a donation by Carol Dunn pictured left with Officer Matt Snodgrass and K9 Armor Co-Founder, Suzanne Saunders. 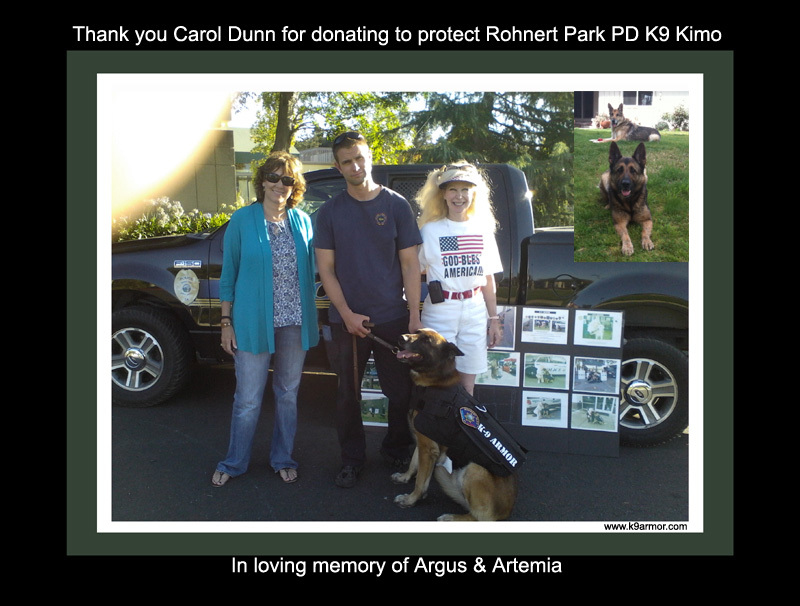 Thank you Carol Dunn for donating $1750 to protect Rohnert Park PD K9 Kimo and Stanislaus County Sheriff K9 Max and another $875 to protect Stanislaus County Sheriff K9 Joker. Carol grew up with Deputy Robert Paris, whom she called "Bobby." 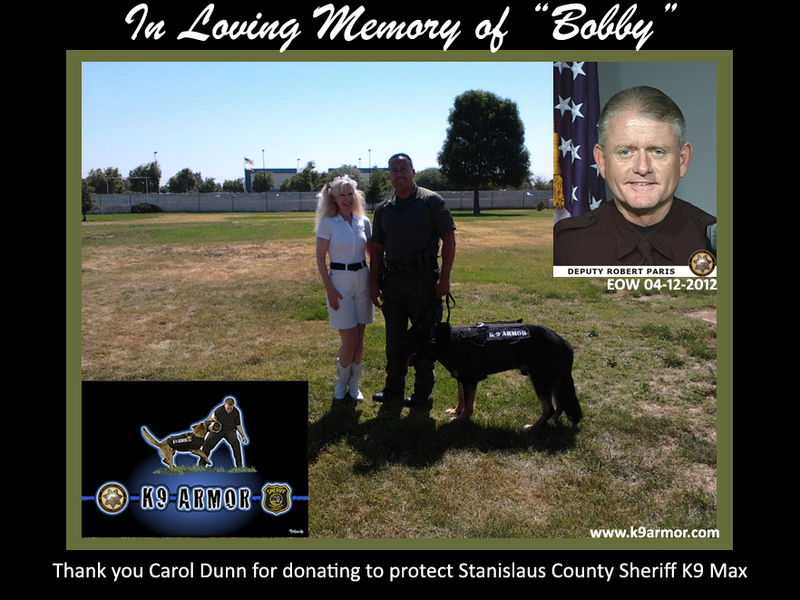 He was a Paramedic before he became a Stanislaus County Deputy and she wanted to honor his memory with a bulletproof vest to a Stanislaus Sheriff K9. We covered all the police dogs on Stanislaus County Sheriff K9 Unit, but for two dogs Max and Joker faced bullets without a vest until Carol came to the rescue. 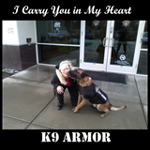 When Carol first donated she asked the next vest go to the police dog most in need. 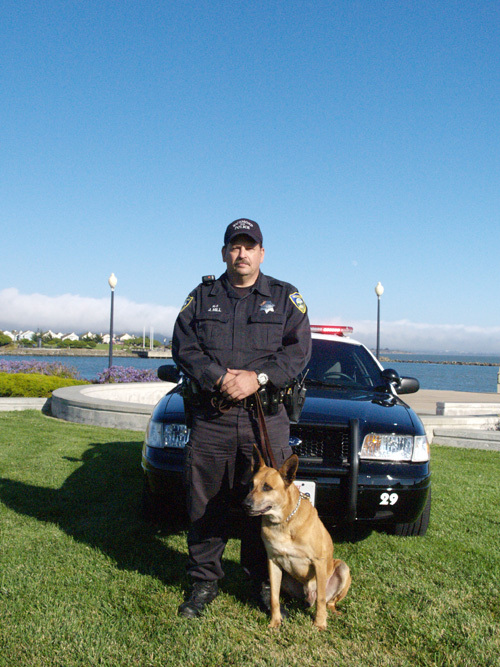 Rohnert Park PD K9 Kimo had waited years for a sponsor. When we checked if he still faced bullets without a vest, the answer was "Kimo is in desperate need of a K9 Armor vest." Thanks to Carol for vesting K9 Heroes Kimo and Max and Joker. 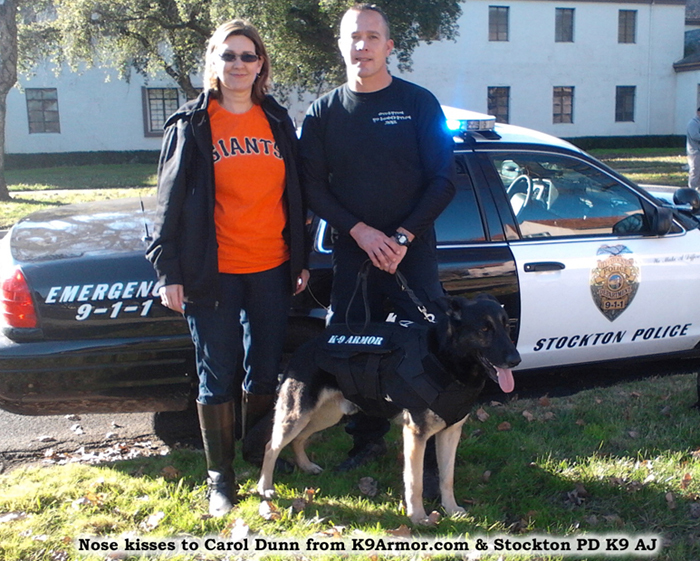 Later Carol donated again and again for Stockton PD K9 AJ & Kaos. Bless you Nicole and Carol, and God Bless All K9 Heroes. A portion of profits from sales of this beautiful graphic are donated to K9 Armor as a Memorial to Deputy Robert Paris by Rose Borisow. Visit her site http://www.roseborisowgrafx.com/ for more amazing artwork. Rose also sent us giant poster-size prints to give to the Stanislaus County Sheriff and one to Nicole Arbelo of K9 Heroes, for raising the funds to protect K9 Sam. 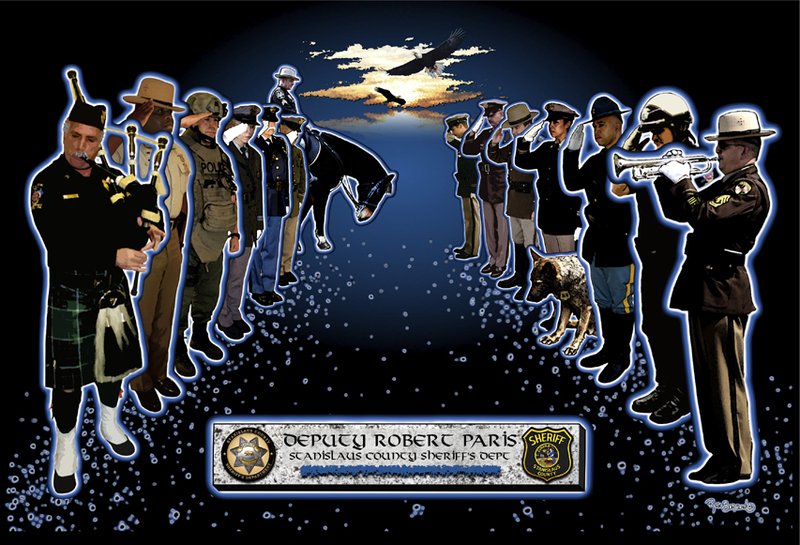 Rose created these works of art in memory of Deputy Robert Paris, EOW April 12, 2012. Thank you David Cutler of Rocklin, for $2000 and $3500 to protect the K9 Heroes of Stockton Police Dept. We are so grateful for a 2nd donation of $3500 by the amazing Freda B Runyon Foundation to protect four more K9 Heroes! 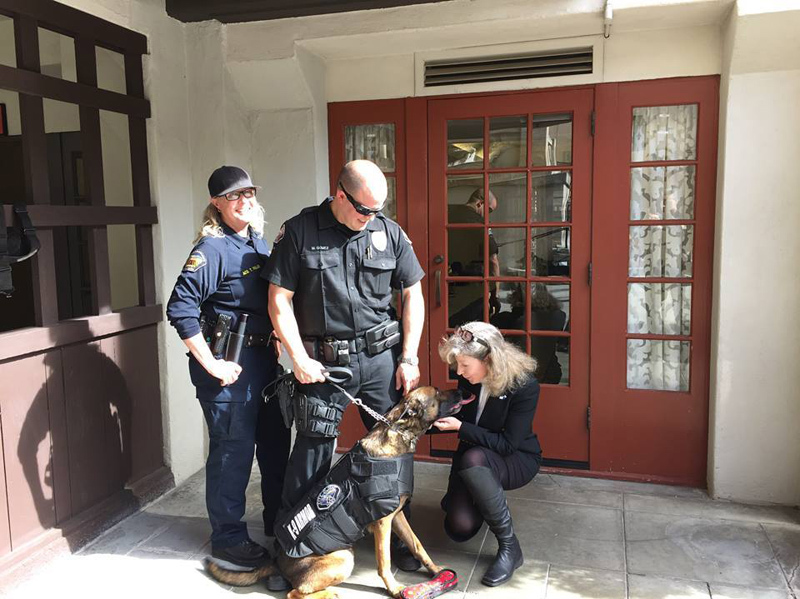 Executive Security Agency invited K-9 Armor to the historic Perry House in Monterey, CA raising funds to donate a new K-9 Unit to the Monterey County Sheriff's Dept. and a bulletproof vest for their K9 Heroes. 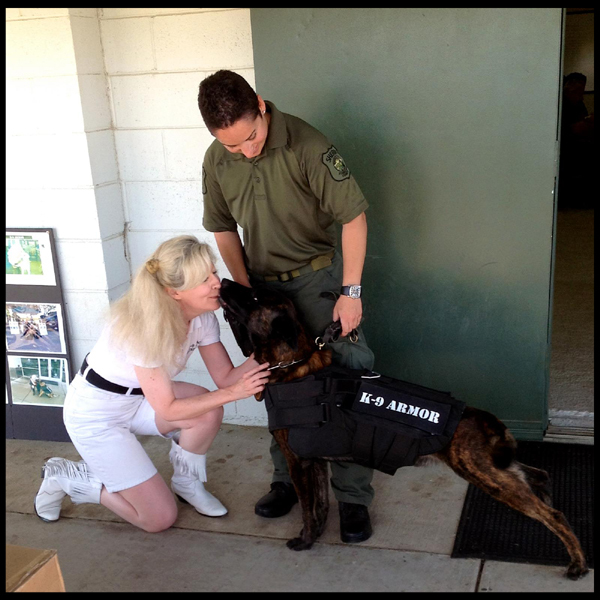 K-9 Armor Co-founder Suzanne Saunders and ESA K-9 Unit Handler Andy Greiner and K9 Wolfie. Thank you Jasmine Viel & Marc Cota-Robles (Marc pictured background) of Central Coast News KION, KCBA for hosting The Policeman's Ball of Monterey and Jasmine for taking this awesome picture. Thanks to Gloria Jelladian, owner of JelladianArt.com Artist & Photographer and owner of AutoArtGallery in Carmel. 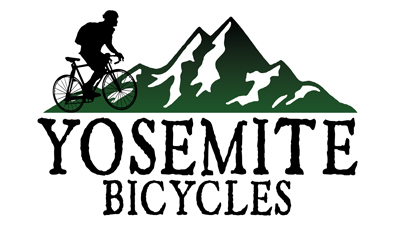 Thank you Jesse Robichaud of Yosemite Bicycles for donating $875 to sponsor Sonoma County Sheriff K9 Karl! Thank you Michael Prichard, owner of Novato Video Transfer! Mike gave his time and expertise to transfer a 20 year-old cassette to make our iTune. Click above to open J International Media Library of Videos. K-9 Armor at Pet Pride Day 2009 on his SF TV show that resulted in $150 in donations immediately after the show! Click left to open his library of videos and pick Pet Pride Day or click here to view the TV Broadcast of K-9 Armor at Pet Pride Day in San Francisco 2009. 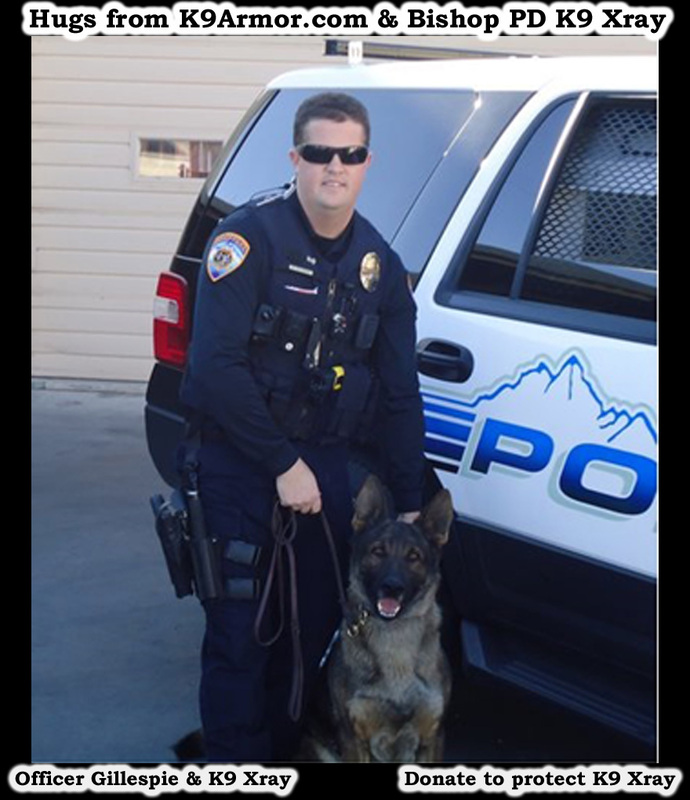 In Loving Memory of CHP Officer Ben Lis and his German Shepherd, Luke we are honored to protect CHP K9 Becks and K9 Dax! 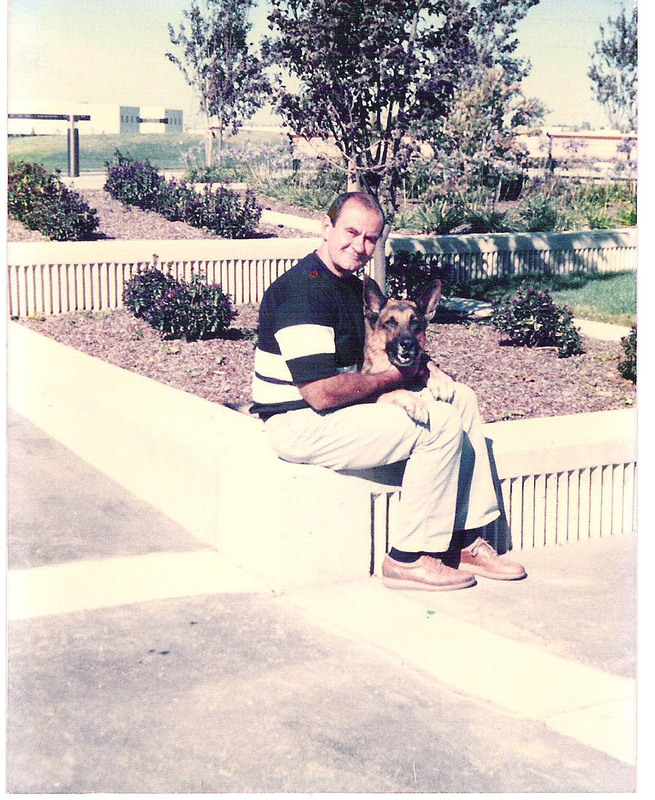 In lieu of flowers, please send a donation on Ben's behalf for his love of dogs, especially German Shepherds and his dedication as a California Highway Patrol officer to... K9 Armor!" 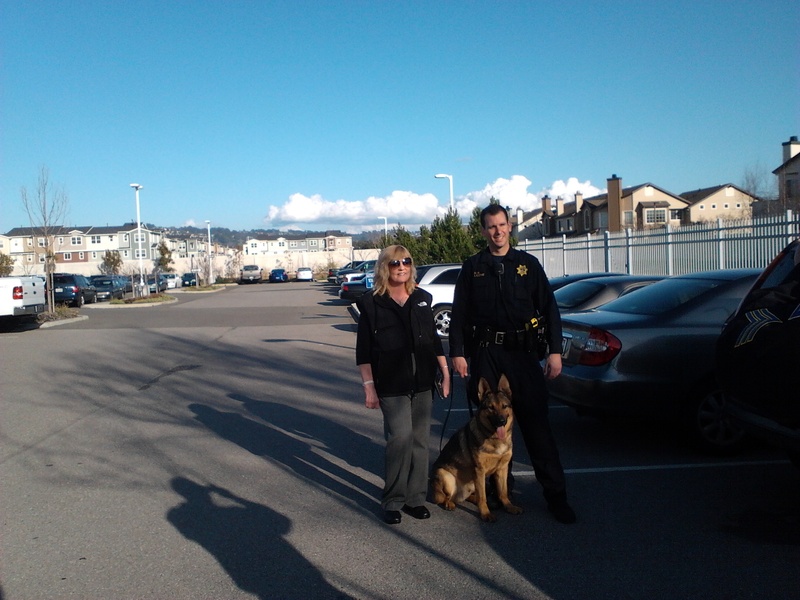 Thank you Richmond resident Ginger Cava for an amazing $750 to cover El Cerrito PD K9 King pictured above with El Cerrito PD Officer Leone and K9 King, and another $750 with family and friends Candy Permillion and Ellen Soohoo to protect California Fish and Game K9 Kilo! Thanks for every donation by El Cerrito, Oakland, Richmond and San Pablo residents following us on our K-9 Armor facebook page to see comments and names of those who donate. The safest, fastest way to pay with Paypal gives you an instant receipt to K-9 Armor for your tax-deductible donation! Donate here to protect the next K9 with a bulletproof vest in loving memory of anyone you love on two legs or four! 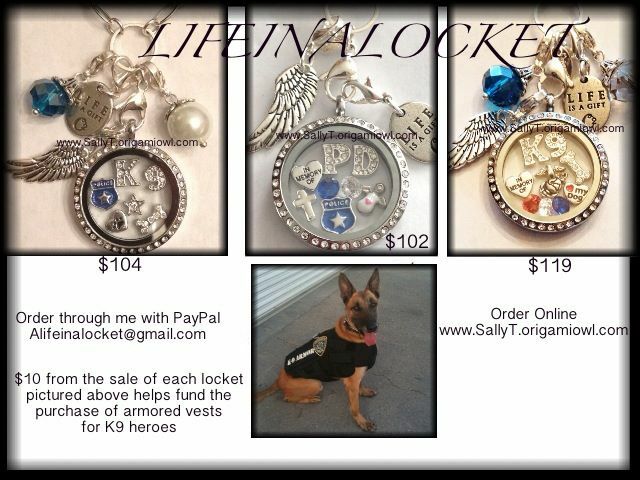 Also Collecting Cash for K9 Heroes, Artist Sally T. has created a custom Life In A Locket for us. We have received $130 in donations a portion of profits to K9 Armor. 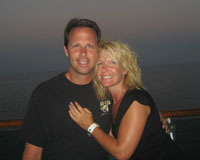 Sally's daughter also promotes our page on her Military Wife facebook and Blog WifeMomWorkLife. 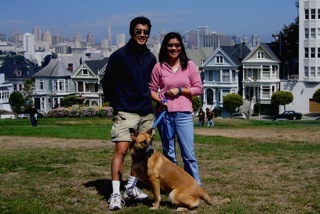 Thank you Sally and your family and beautiful LifeinaLocket helping us protect our K9 Heroes! U.S. Park Police Officer Pat Smith & K-9 Hunter at Bark in the Park 2004. 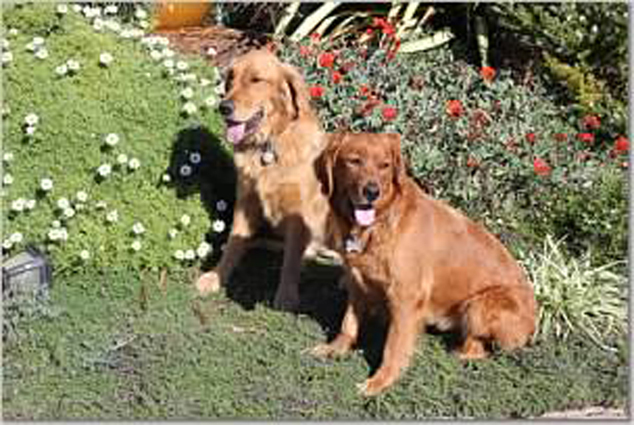 Many thanks to Eric and Tina Warvi of Paws Place for helping us raise $46 at Taste of Morgan Hill 2011 and $110 at Bark in the Park 2011, $97 in 2010, $78 in 2009, $145 in 2007, $107 in 2006, $105 in 2005 and who donated a whole vest for U.S. Park Police K-9 Hunter in 2004. Bark in the Park where thousands of dogs bring their Best Friend, to Naglee Park in San Jose, CA. 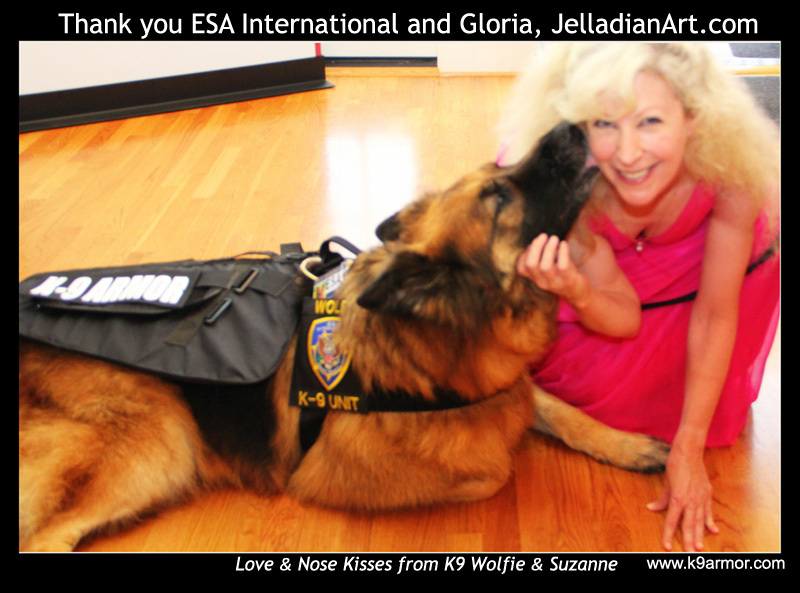 Thanks again to K-9 Armor's interview by Suzanne Lavalee on her SB Newsletter which featured us in her July issue bringing us kind sponsors. We received donations from Dr Gold of St Helena Veterinary Hospital for St Helena PD K9 Djino and two readers from Richmond who sponsored Richmond PD's next K9 and bulletproof vests to San Pablo PD donated thanks to our sponsors. 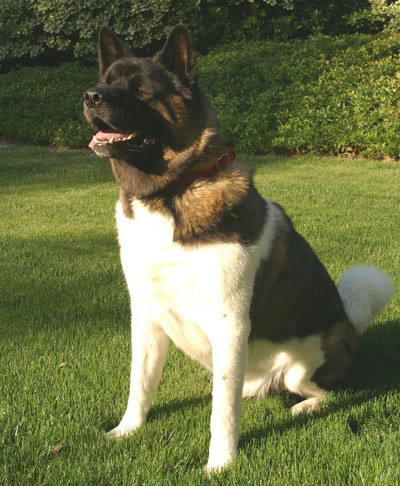 Thanks to Linda of Richmond who also donated for Richmond PD K9 Ranger to wear a K-9 Armor bulletproof vest in loving memory of her Akita, Kashi. Thanks to Linda of Richmond for sponsoring Ranger in loving memory of her Akita, Kashi and to Linda and Janet of El Sobrante for donating again for Richmond PD's next K9 in training you ladies rock! 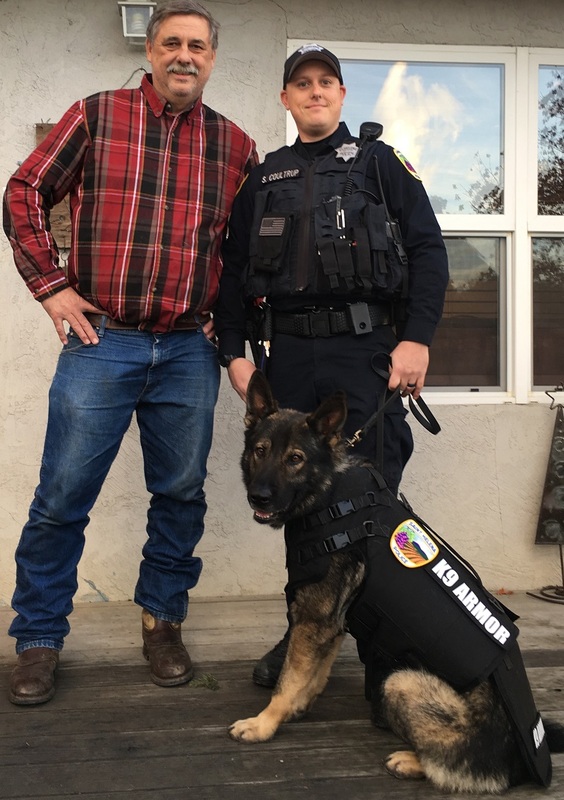 Thank you generous sponsors from El Sobrante, Berkeley, Foster City and San Rafael we provided a free bulletproof K9 Armor vest for San Pablo PD K9 Tango! 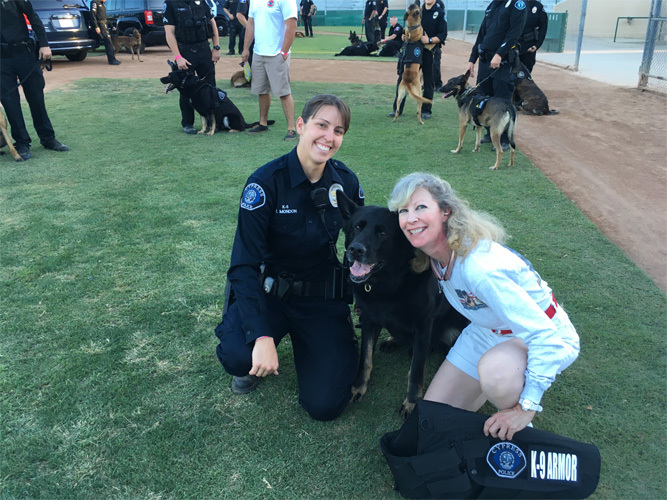 Thank you Suzanne Lavalee, Editor of SB Newsletter for your awesome article bringing us sponsors for these police dogs! Thank you so much we raised $110.00 in 2011 and thank you to the Falkenbergs for a generous donation of $200 and Amy Feezell for $100 in 2010 and to the Tallericos who donated an amazing $750 for Richmond PD K9 Rasp, and Ruth Ramirez donated $750 for Sonoma SO K9 Axl, both dogs received vests! 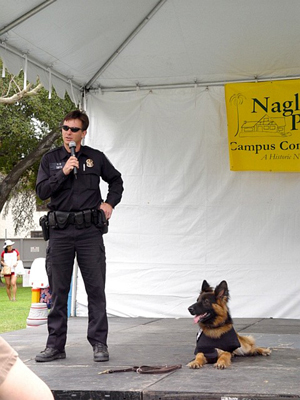 Every year we add police dogs to protect as they come from all over California to compete. They are all Champions! A very special Thank You to Petaluma PD K9 Sergeants Ed Crosby and Mark Hunter for inviting us every year from 2005-2010 to their K-9 Trials where we raised the money and met the dogs we needed to find who came from all over California to meet, shake paws, and compete for Top Dog. Over the years. 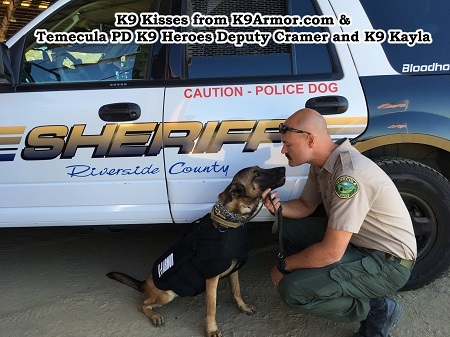 we accomplished so much protecting 32 police dogs with free K-9 Armor vests because of generous people who donated to help protect the brave, beautiful police dogs of California. Petaluma PD K9 Kilo competed for top dog at the Sonoma Sheriff K9 Trials and his biggest little fan came to cheer! Her Dad depends on his K9 partner with his life on the job and at night he guards the family, she wants her Dad and Kilo to come home safe every night but only one of them had a vest until YOU donated for Kilo thank you to all our Sponsors! © Copyright 2011 The Dogfather K9 Connections, LLC. All Rights Reserved thanks to Tim Gooler for Web Design. 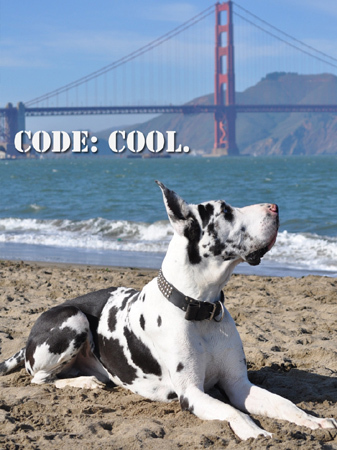 Thank you Dogfather for offering discounts to law dogs! 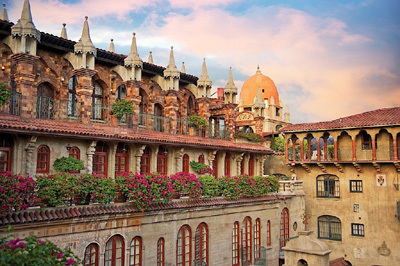 Discounts for Senior Citizens, Military, Law Enforcement, Firefighters and Teachers! and inquire about your Dogfather discount! 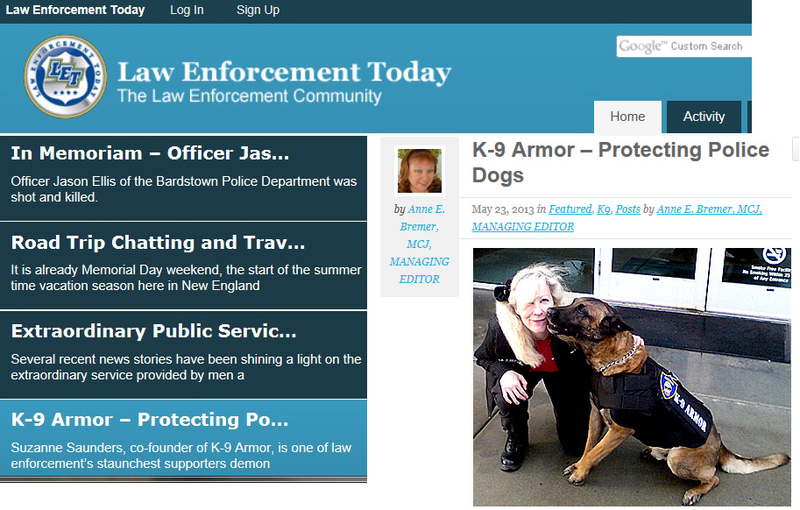 Thank you PoliceOne.com for listing K-9 Armor in your PoliceOne.com K9 web site directory and posting a video on your BlueTube video site. Thank you PoliceOne Magazine Senior Editor Doug Wyllie, for your interview of Suzanne Saunders, K-9 Armor Co-Founder, Treasurer and Webdiva with Michael Levy, Founder of Pet Food Express which held a fund raiser July 18, 2009 for retired K-9 Veterinary Care and for K-9 Armor bulletproof vests for police dogs. Click the picture below of PoliceOne Magazine Senior Editor Doug Wyllie to read his excellent article on the NIJ Standard IIIA .06 Kevlar explained in great detail why our heavy-duty K-9 Armor rules! Follow the link to their site by clicking the pictures of their amazing work! Many thanks to CARDA CA Rescue Dog Assoc. 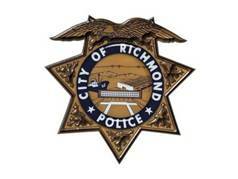 for $400 toward Richmond PD K9 Unit and gathering supporters to protect the police dogs with K-9 Armor bulletproof vests. They are helping us reach the right people because that is their expertise! 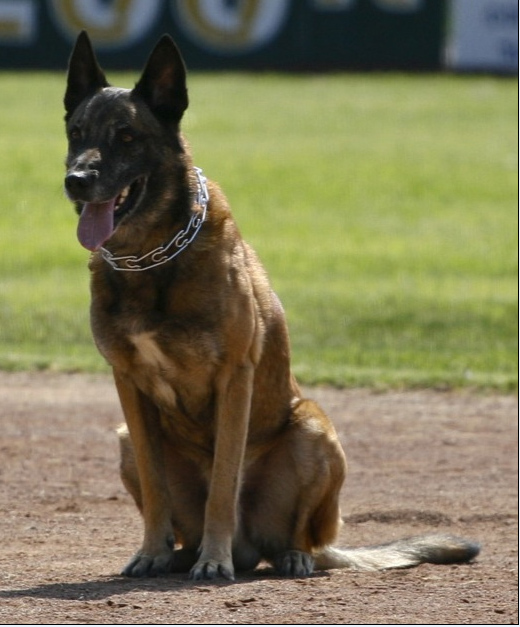 El Cerrito PD K9 King, photo by El Cerrito Patch read the terrific article! 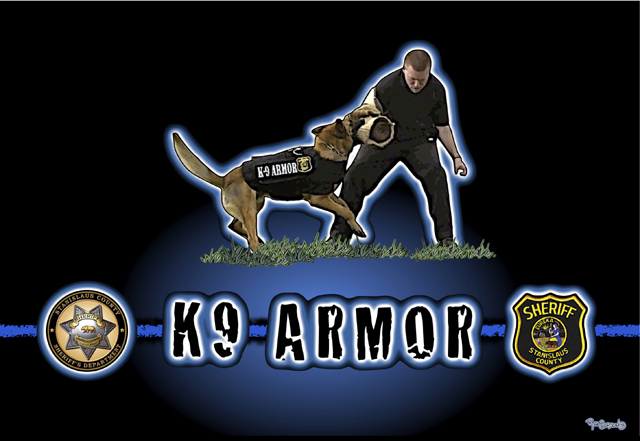 Thanks to James Lindfors for $750 to K-9 Armor to protect Richmond PD K9 Ronin! K-9 Armor, Officer Mandell and K9 Rasp, San Pablo PD Officer Danielle Bowler and K9 Ivan wearing a new bulletproof vest each thanks to donations by Chris and Karen Tallerico and the Freda B Runyon Foundation! Thank you Chris and Karen Tallerico for $750 protecting Richmond PD K9 Rasp! At the Petaluma K9 Trials August 7, 2010 we received a generous donation of $750 from Chris and Karen Tallerico of Hercules, for a whole vest to Richmond PD in memory of fallen K9 Officer Brad Moody, we are proud and honored to apply their donation of a bulletproof vest for Richmond PD K9 Rasp. Pictured left, Rasp and his handler Officer Mandell, were recently engaged in battle with a bank robber shooting at Rasp and the suspect broke off the dog's tail as Rasp held on and took down the bad guy. At the Petaluma Trials we saw Rasp perform with great determination even without his tail. What an incredible story. Many thanks to Dennis Lines of Century 21 M&M for donating $3250 providing K-9 Armor vests for the Stanislaus Sheriff K-9 Unit. Visit his site for great deals in Real Estate in Monterey, Santa Cruz, Santa Clara, San Benito, San Mateo, Alameda, Contra Costa, Merced, Stanislaus, Sacramento, San Joaquin, Yolo, Placer, San Francisco, Sonoma and Napa Counties! Lynda Ellingson of Cupertino for $500! February 2011, just as we promised to raise as much as we can to help protect the dogs hitting the streets without a bulletproof vest, Lynda sent us a check for an amazing $500. and the Horse Expo in Sacramento, California! The Freda B Runyon Foundation for $3500.00! 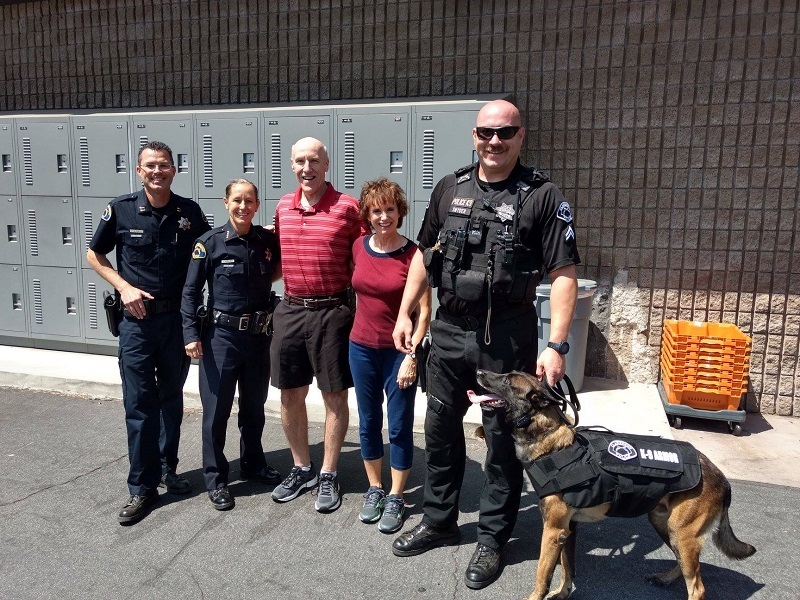 A special Thank You to Richmond PD K9 Sergeant Mitch Peixoto pictured right, who allowed his K9 Officers to come to shake paws at events to help us raise money, and to attend trials where they compete and demonstrate how they protect the community. Thanks to the Freda B Runyon Foundation donation of $3500 in August 2010 we ordered 4 vests! Thank you Sharon and the Board of Directors of the Freda B Runyon Foundation! They designated $500 for El Dorado County Sheriff Canine Troy, $1500 for 2 lucky Richmond PD canines and $750 for CHP, with the $500 left over for K-9 Armor to continue to give a free vest to every police dog in California, who all send nose kisses of thanks. Linda and Rob March for $750! 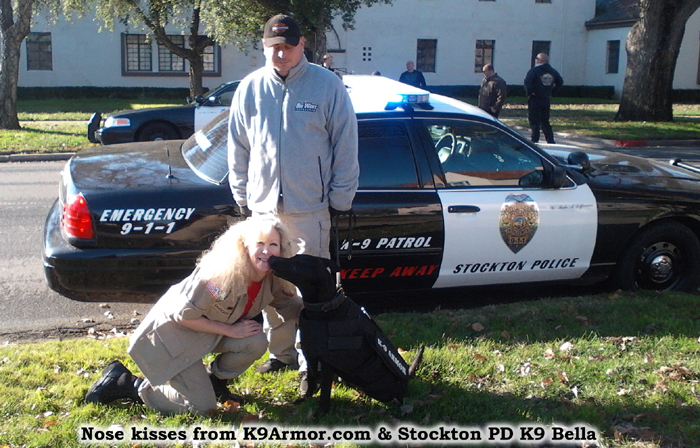 Many nose kisses of thanks to Linda and Rob of San Jose, who donated $750 in August 2010 for all the police dogs. What a generous gift to the beautiful dogs who give their lives to protect us, and all we can do is give thanks for your generosity! Thanks to Bob and Amanda at Animal Naturals for the box of Go Dog samples and water bottles we gave as thank you gifts to dozens of kids at the Petaluma PD K9 Trials 2010, so generous! Click the picture left to visit their web site they also sell animal products for cats, dogs and horses. At the end of the last K9 Trials of the year we gave the extra samples to Petaluma Animal Shelter who brought pets to the K9 Trials needing homes and thirsty for Go Dog thanks and tail wags! The Barry Family Foundation $750.00! Thank you so much Brad Barry, for your generous donation from your Family Foundation of $750 to start 2010! K-9 Armor is funded only by donations from kind people like you and your support means the world to us! 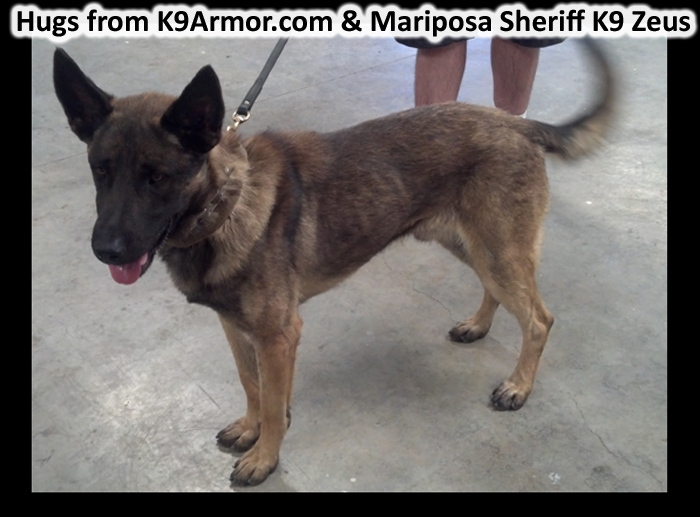 Thanks to the Western States Horse Expo in Sacramento, CA June 11-13, 2010 we raised $180 and added El Dorado County Sheriff K9 Troy to the K-9 Armor pack. We also met amazing people who depend on service dogs that heal, search and rescue, track and if police dogs, face poachers and robbers with guns. 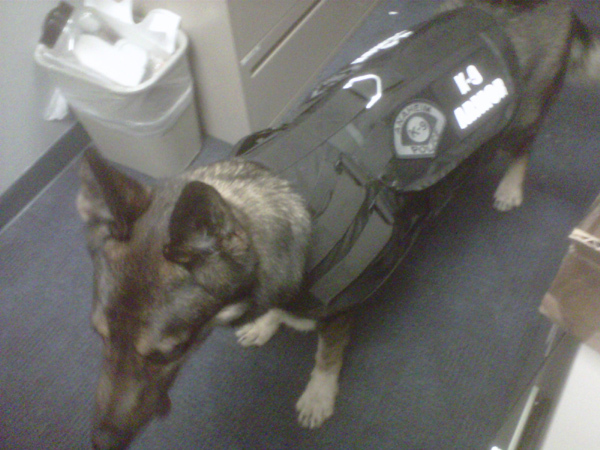 We gave a vest to K9 Troy by February 2011, and look forward to attending future Expos to show and tell. Thousands of Horse Lovers flooded the Sacramento Expo Center to the first Dog Expo Pavilion to help our canine working dogs show their stuff and raise some cash for good causes. Click the eBay GivingWorks logo to help us raise cash for police canines! This is your chance to help us protect those who lay down their lives to protect us. ebay Community Sellers list their products in the GivingWorks section of the eBay web site where part of the profits benefit tax-deductible charities including K-9 Armor. Donate a portion of your sales and attract more customers with the special charity ribbon logo. We will gladly add a link to your web site here on our Sponsors page to say thank you if you choose to add an item to auction and donate a portion to help save the police dogs.. Many thanks to Anthony for doing a great job on our K-9 Armor uniform shirts and bulletproof vest side panels to silkscreen our logo, on all the vests. Brand Impression helps to generate donations and guide police dog handlers by advertising our name with a quality product that sets the standard of excellence. Thanks also to owner Jeff who approved a discount so we only pay $12 a pair to help our overhead costs! Thank you Dr Chris Flowers for this excellent video posted on YouTube! 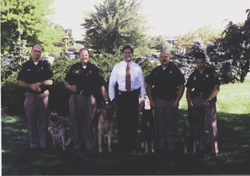 This promotion from 2009 helps describe the need for bulletproof vests for these K9 Heroes. We also helped promote the good work of the WSPCA including medical benefits for retired K9 Heroes. Many congratulations to all the K9 Heroes who received a bulletproof vest from donations by Pet Food Express to the WSPCA. Thanks to Diana, owner of Pet Nannies Plus who donated $200! She provides cat sitting, dog walking, injections of medicine, transport to vet and groomer appointments. She loves animals and animals love her! Call her for prices and availability, covering Marin County and surrounding areas. 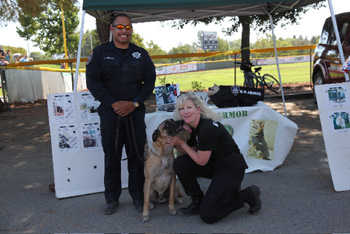 K-9 Armor started in 2003 in Marin County, and attended the County Fair Public Safety Fun Zone sponsored by the Marin County Sheriff's Office from 2004-2009. 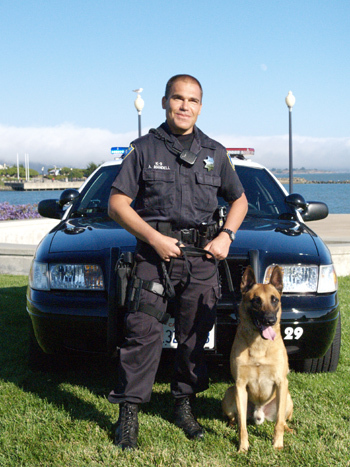 During those years we raised enough for bulletproof vests that K-9 Armor gave for free to Marin Sheriff K9 Verona and Terry, to SF Park Police K9 Hunter and Tref, to Novato PD K9 Raven and Kyto, to Fairfax PD K9 Boss, to Petaluma PD K9 Rico and Kilo and to Richmond PD K9 Arrow. Every one of those police dogs came to the Fair to shake paws with hundreds of children. Many heartfelt thanks to Deputy Evan Hughes for 6 years helping us protect those who lay down their lives to protect us! Many thanks to Deputy Karen Wofford for providing a return link to our site from the official County web site, click the logo or the Marin County Sheriff star. 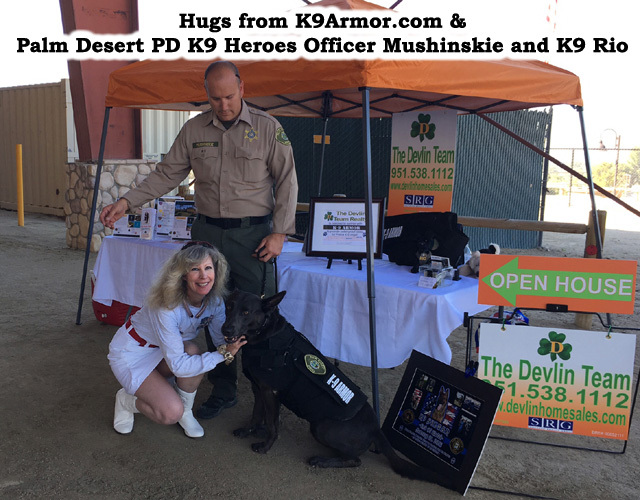 Thanks to Vavadog for providing clothing and gifts to all contestants and to Rex at Star Universe for bringing his Spokesdog Jenny to model our K-9 ARMOR vest. Thanks Conrad, Dan, Breanne and the whole pet-friendly staff at Rogue! 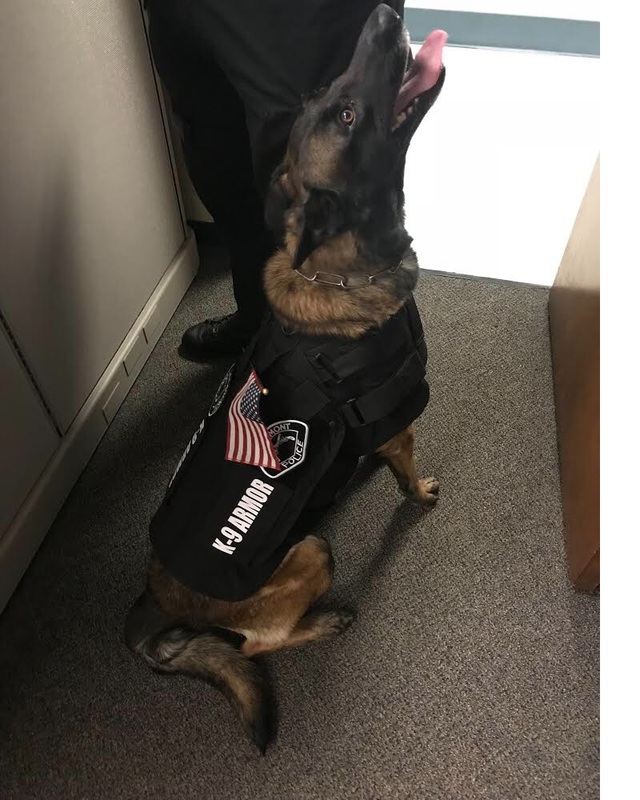 Thanks to an angel who prefers not to advertise a business or publish her name, we salute you for donating a whole vest to Oakland County, MI Sheriff's Department to their K-9 Rudy in 2006. 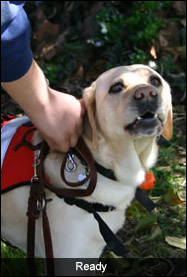 Thanks so much to Sebastopol Community Center for donating $440 June 12, 2006 from their Dog Obedience Class. Thank them by attending their excellent classes, click their logo to visit their site. Thank you Modesto Ducati and Modesto Harley Davidson for purchasing a whole K-9 Armor vest for the Stanislaus Sheriff K-9 Unit! 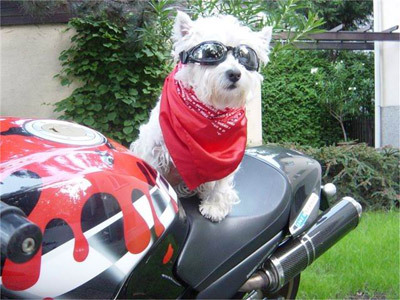 Visit their dealership for the best bikes in Modesto! 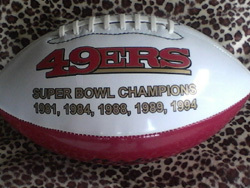 Thanks to Chevys Restaurants in Novato and Greenbrae, CA. 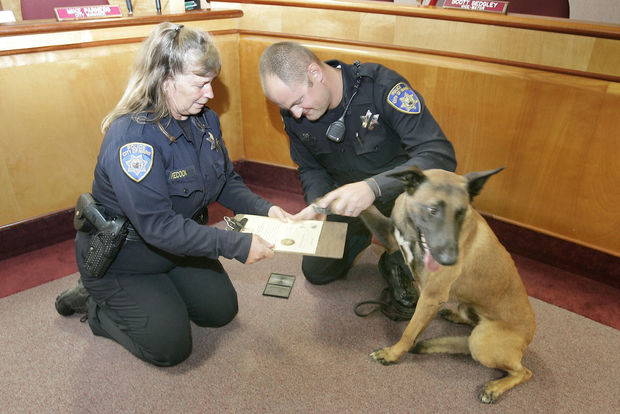 February 17, 2005 we appeared at both locations with a K-9 to shake paws with many happy kids and generous people who helped us raise $600 for Novato P.D. K-9 Raven. Many thanks to Marsha Monro and Gena Egelston of the Westin St. Francis on Union Square in San Francisco. $225.00 Retail, we donated this pillow to Vallejo P.D. who auctioned this pillow at the 2004 K-9 Trials Event. 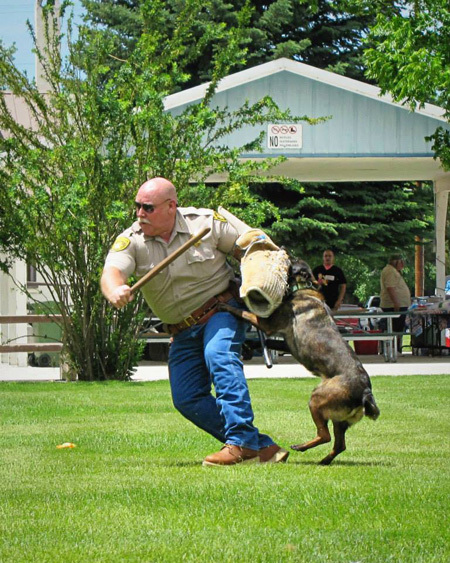 The trials are held every year in memory of Officer Jeff Azur and his K-9 both killed in the line of duty. Feb 19, 2004 - San Rafael, CA, Macy*s at Northgate Mall sponsored K-9 ARMOR Day for Employees only. Macy*s allows employees to select K-9 Armor to donate a portion of their salary every month.